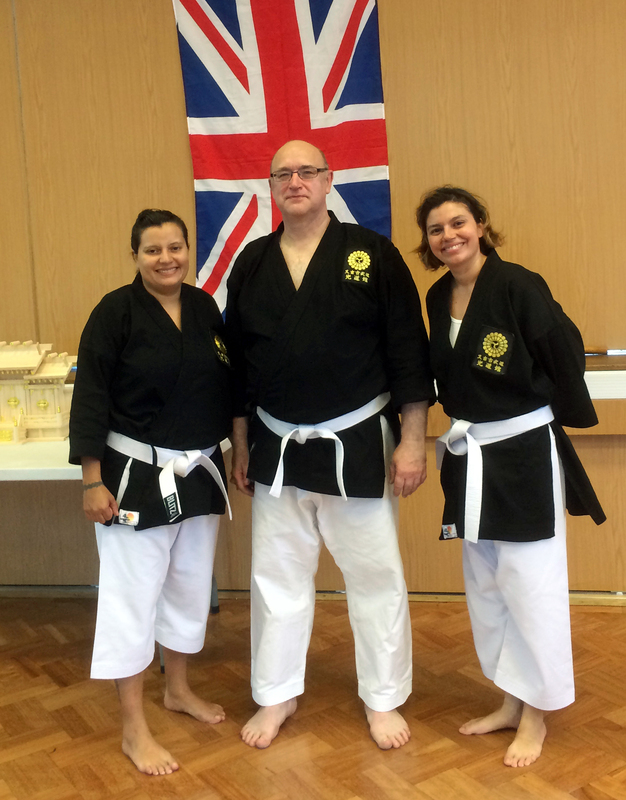 Our 10th MKKI UK Branch Gasshuku started with the arrival of Sanguinetti Sensei, and for the first time Gaines Sensei, on Wednesday 2nd September 2015. Gaines Sensei is one of Sanguinetti Sensei’s top Dan grades in the MKKI, and I was pleased to meet him and to train with him over the weekend. They both arrived at Darlington Station late afternoon after landing from the USA in London and training up to Darlington. They checked into their hotel and we all, including Chris San (my wife) went out for the evening meal. It was nice to see Sanguinetti Sensei again and getting to know Gaines Sensei. The Thursday 3rd September Chris and I had arranged to show Sanguinetti Sensei and Gaines Sensei the old Bolton Castle near Leyburn. They are both into history so I knew they would enjoy this visit. 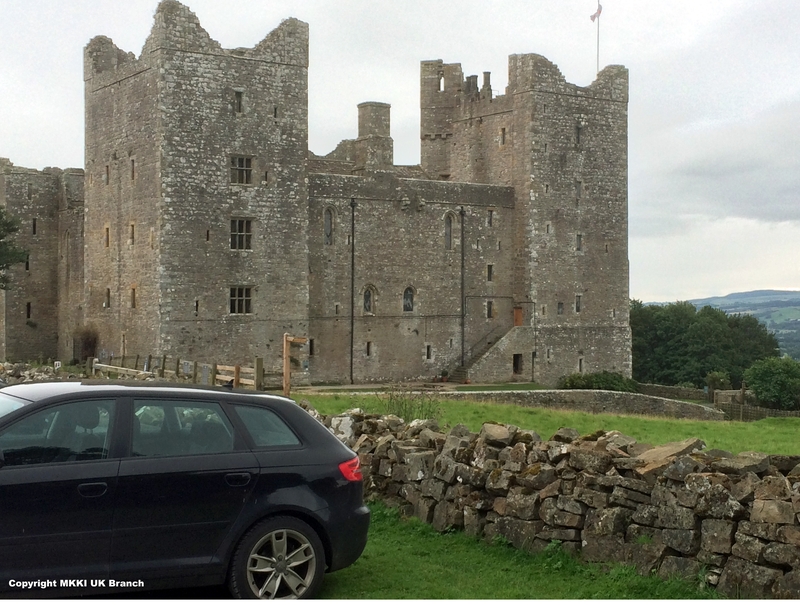 Travelling through the Dales we finally arrived at Bolton Castle thanks to my trusted SatNav, as I have a reputation of turning left when it should be right and going north when it should be south. This became a “leg-pull” for me throughout our time together as Chris enforced this reputation. However, I did get there and we all explored the castle finally leaving mid-a fternoon. Instead of going straight back to the hotel, I thought it would be good to deviate via Tan Hill and show Sensei the highest pub in the UK. When we arrived we went in for a little tipple; it was a good atmosphere with visitors and the fire was burning giving the pub that old smoky smell from days gone by. I’m sad to say that when we left my SatNav decided to play up, but I knew the way home. Turn left from the pub and set off down the moors road. Then a voice from the back of the car said “you’re going the wrong way it should have been right”. Dam my orienteering skills have kick in again; so I had to gingerly turn around on the small moors road – thank you Chris. After some time I still thought we were going the wrong way, but I was convinced when my SatNav decided to come back on. I was in for some more “leg-pulling”. Finally we arrived back to the hotel and planned to go out for the evening meal at Walworth Castle. We had been here in previous years but Gaines Sensei has never eaten in a real castle before so I thought it would also be good for him. On Friday morning I picked up Sanguinetti Sensei and Gaines Sensei for the start of my Gasshuku training. 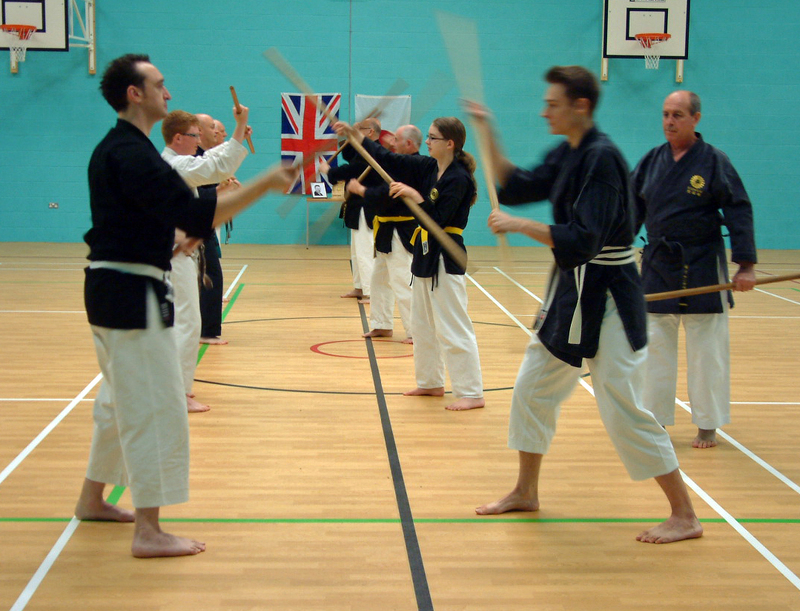 This was held at the Clifton Centre from 9.30 till 1.30 pm and Sensei put us through our paces going over some Hojo Undo, expanding on what we knew and giving some fine details, and answering some questions I had on Kata and Bunkai. It was good to train with Gaines Sensei and to be the Uke on some of the Bunkai. 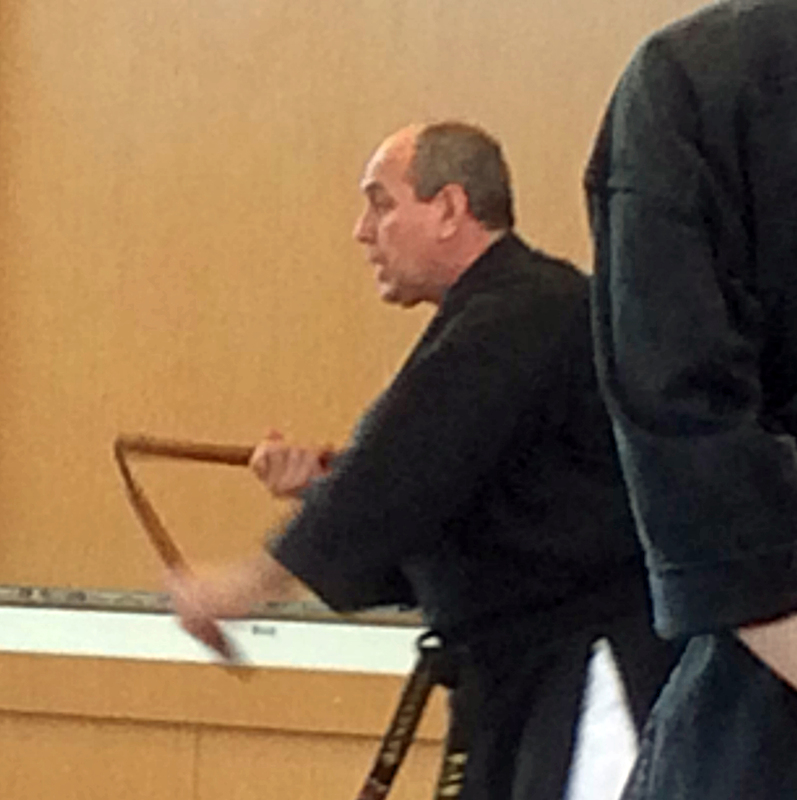 In addition Sanguinetti showed me some of the first few moves to a new Sai Kata called Shinbaru No Sai. This had a totally different feel to the first two Sai Kata in that it got you moving in different ways and different co-ordination. I can see this was going to be challenging to learn and a very interesting Kata. After training we went out for a pub lunch and I then took Sanguinetti Sensei and Gaines Sensei back to their hotel to rest before the evenings Instructors training at 6.00pm. During the evening session we had the arrival of Brüchner Sensei and his wife, Barbara, from Bavaria in Germany. I was glad to see them make this trip and to get acquainted with our MKKI German Branch. We also saw McKenzie Sensei from Scotland on his first Gasshuku, and arriving late was Philip San from Nottingham. Poor lad had to get a taxi from York to Darlington as there was a problem with his train. Very expensive trip but he got here around 7.00 pm much to his commitment and enthusiasm to train. After 3 hours of training we stopped to finalise the night with a get together around the table with Domino pizza brought into us by Chris, and good conversation after which we took Sensei back to his hotel. The Saturday morning started by picking up Sanguinetti Sensei and Gaines Sensei for training at 10 am at Longfield Academy. When we got there Sensei went round to meet and greet all the participants. After our formal bows Sensei gathered us around and explained why we were all wearing white belts. It’s to remind us not to forget our initial intensions; that is we all should remember that although we are of all different grades we are still beginners, and not to think that we know everything that we have already learnt. 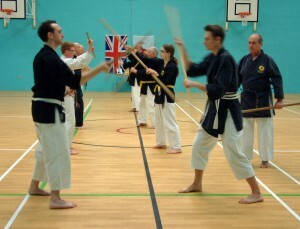 For example our first technique in Bo No Hojo Undo Dai Ichi, there is always room to improve and refine it. We started the day with Junbi Undo, warm up exercises where Sanguinetti Sensei had us all counting to 100 and beyond in Japanese. 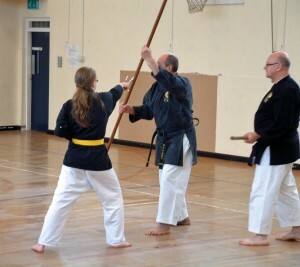 After this we went onto Bo No Hojo Undo Dai Ichi, followed by the Bunkai. During this time Sensei always mad e sure that we were using good technique and correct body mechanics to perform power and penetration in strikes and blocks. 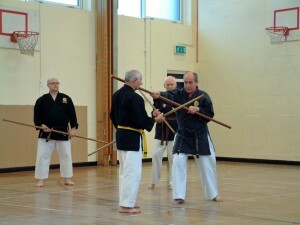 The Bunkai is carried out with power on the strikes, so our blocking had to be good. However, in order for us to learn to control our strike some of them were not blocked. Here we had to trust our partners. The Hojo Undo was followed by Shushi No Kun Kata and prior to the practice of this Sanguinetti Sensei gathered us around and explained the meaning behind Shushi No Kun and some of the history. After going through this Kata we all separated to practice the Bunkai. The morning went by very quickly and we broke for lunch, which gave time for making notes on what the morning’s training. The afternoon started with Bo No Hojo Undo Dai Ni and the corresponding Bunkai. This was followed by the second Kata, Choun No Kun, and again Sensei explained the meaning behind this Kata. 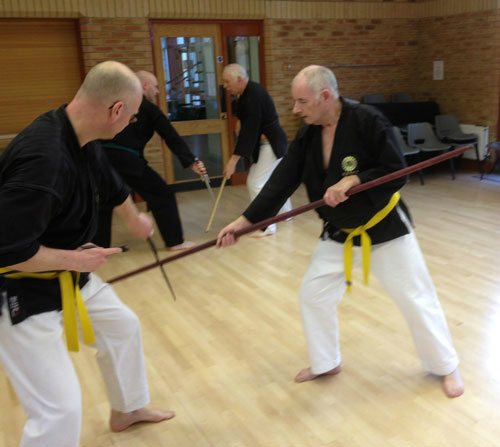 After this we went onto Tunkua and as before Sensei gathered us around and explained the history behind this weapon. 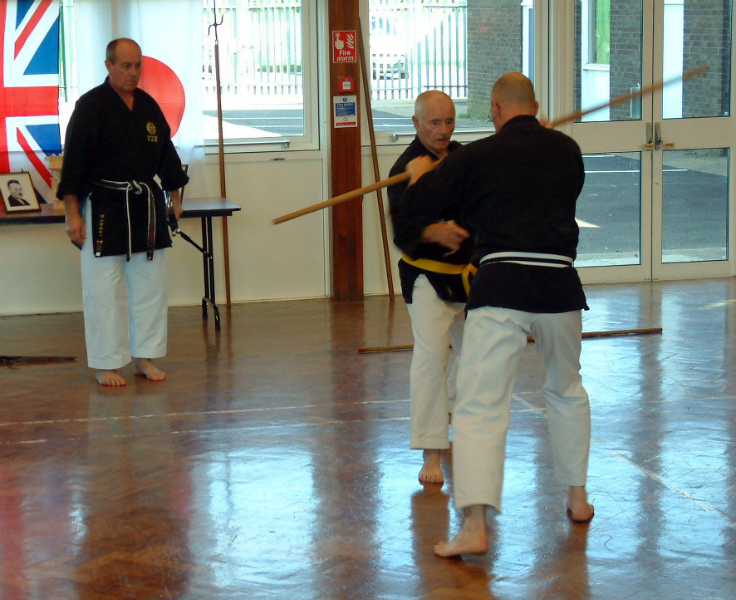 Once back in class lines we were training in Tunkua No Hojo Undo which lead into the associated Bunkai. Paring up for this soon showed us how Good/Bad we were in our techniques as we had to block and counter incoming Bo strikes with the Tunkua. This is because Tunkua requires a lot of body movement to carry out the techniques with proficiency. 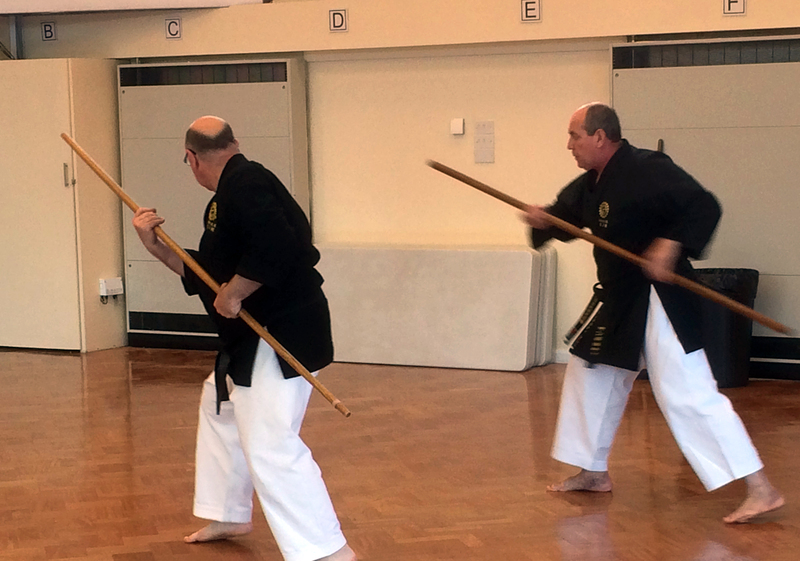 To finish off the day we performed the Tunkua Dai Ichi, the first Kata for this weapon. By this time of the day most of us were exhausted and mentally tired, but feeling euphoric on the day’s training. Finishing of the training at 4 pm Chris and I took Sanguinetti Sensei and Gaines Sensei back to their hotel, while Rob San took Brüchner Sensei and his wife back to theirs, and Mike San took McKenzie Sensei and Philip San back to their hotel, so no one was stranded. 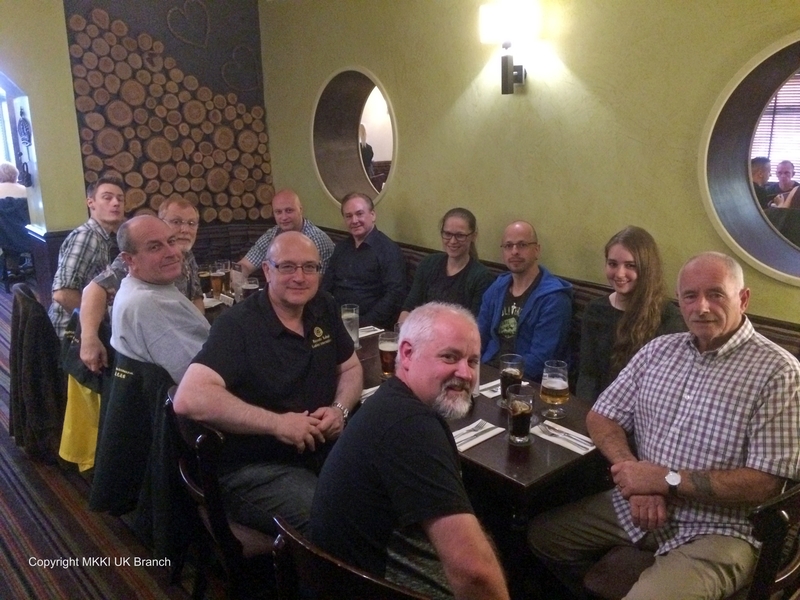 On the Saturday evening some of us got together for the Gasshuku evening meal at 7 pm at the Burtree Inn. This was a great evening with good food, company and conversation. Everyone at the meal enjoyed the night. 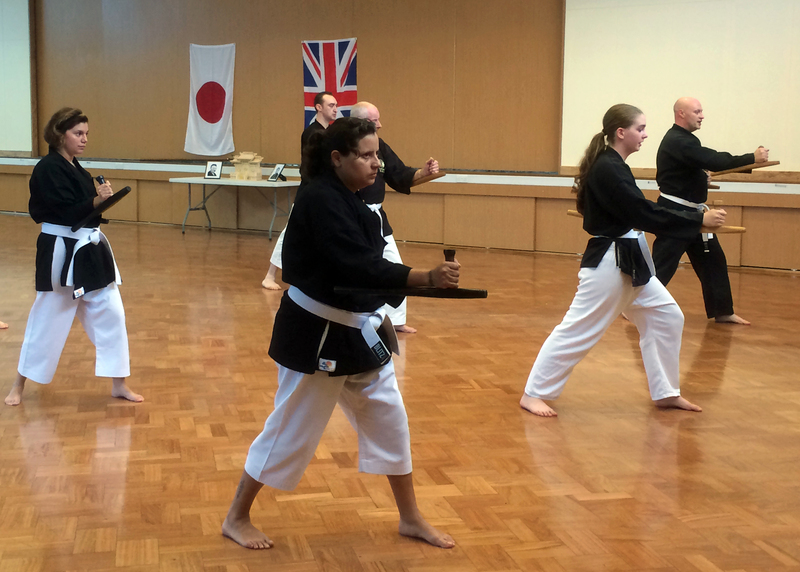 It gave us time to switch off from the up and coming grading, which was going to take place on the Sunday afternoon. Sunday soon came up on us, and it was going to be a long day as we started at 9.00 am and would not be finishing until 5.00 pm. But I knew from experience this time would flyby. The afternoon was going to be grading for the students that were ready for their next grade. I too was recommended to take the Sanda n test and was nervous about this, but this soon went as the day’s training started. Sanguinetti Sensei again started the morning with Junbi Undo, warm ups, which followed with Bo No Hojo Undo Dai San and associated Bunkai. 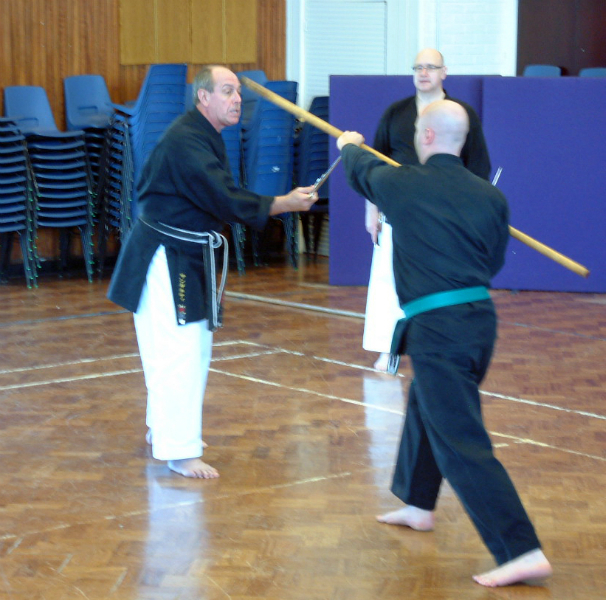 After this we changed weapons to Sai, and trained in the Sai No Hojo Undo and the Bunkai. 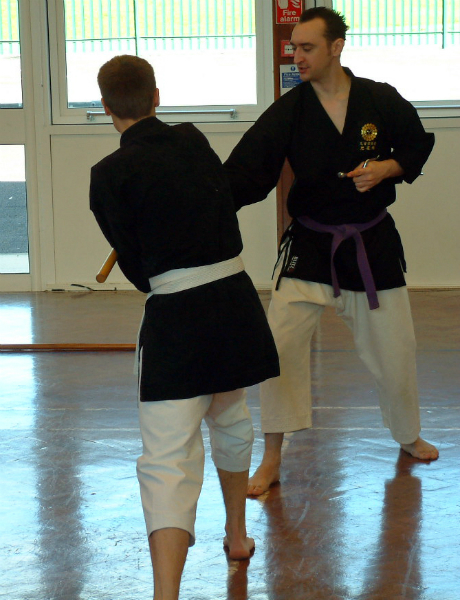 This was followed by Nicho Sai Kata and its Bunkai. 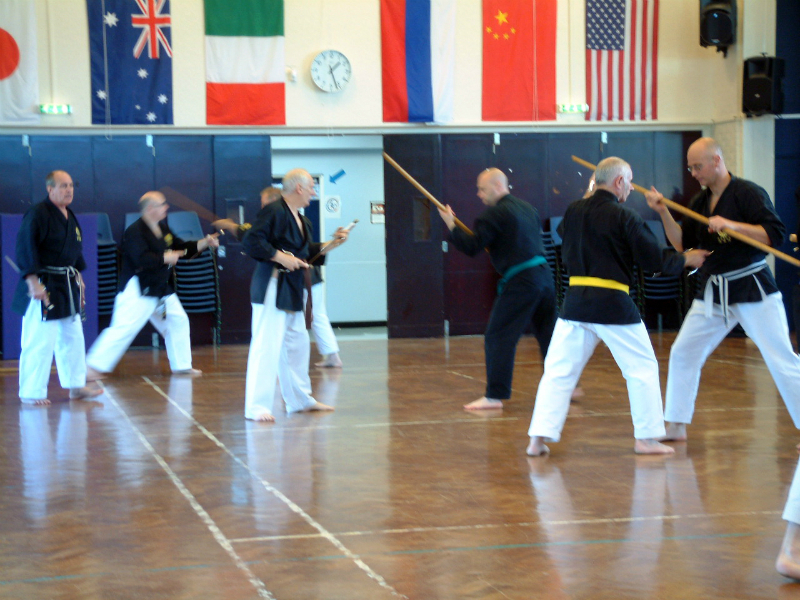 Sanguinetti Sensei then separated us and some continued to work on the Nicho Sai while higher grades went on to train in the second Sai Kata – Sancho Sai. Lunch time soon came around, which gave us time for writing up our notes. After lunch we all lined up for our grading which was going to be all afternoon. The students that didn’t grade also lined up as Sensei says it’s another chance to get some training. The grading works by starting with 8th Kyu syllabus and then going through the grades up to the highest grade, which in this case was Sandan, as I was in the line for this test. By the end of it I was exhausted and my mind was numb, but I was not the only student going through this as next to me was Gaines Sensei who is a Yondan. He was also to be my partner in bunkai. I was extremely grateful that Gaines Sensei was there as his presence and commitment pushed me on. And yes I’m very please to say that I passed my Sandan. Throughout the weekend Sanguinetti Sensei had also worked with me along with Gaines Sensei. We covered all of the associated weapons; and I also had time to work the Sai Kata Shinbaru No Sai which Sensei showed me on the Friday. My Gasshuku didn’t finish here as I was invited to spend more time with Sanguinetti Sensei and Gaines Sensei on their visit to Scotland. During this time I met Sanguinetti Sensei’s daughter Nicolla San. I felt very honoured and accepted their kind invitation, so I had a great time in Scotland from Monday to the following Friday – this will be another article. Before I end this report I would like to say thank you to all who made our 10th Gasshuku weekend very enjoyable and challenging. 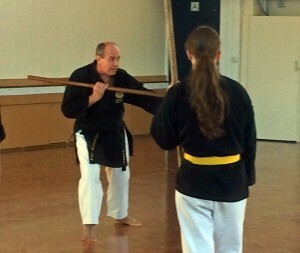 A special thank you goes out to Brüchner Sensei and his wife for coming from Bavaria in Germany. It will be good to see them again in the near future either here in the UK or Germany. Also a special thank you from me to Gaines Sensei for coming to the UK from Nebraska, USA, he was a great influence on me and my students. I hope to see him again in the future, and feel that I have made another good friend. My final word goes out to Sanguinetti Sensei for again making time and coming to the UK and teaching us the real Matayoshi Kobudo affiliated to the Matayoshi family in Okinawa. Without Sensei’s invaluable knowledge in this art we would not be where we are today in Matayoshi Kobudo, so my heartfelt Arigato Gozaimasu goes out to Sanguinetti Sensei. We in the UK will always strive to do our best according to your teaching! It is my intension to try to briefly explain what Kobudo is and how is has arisen to where we see it today. 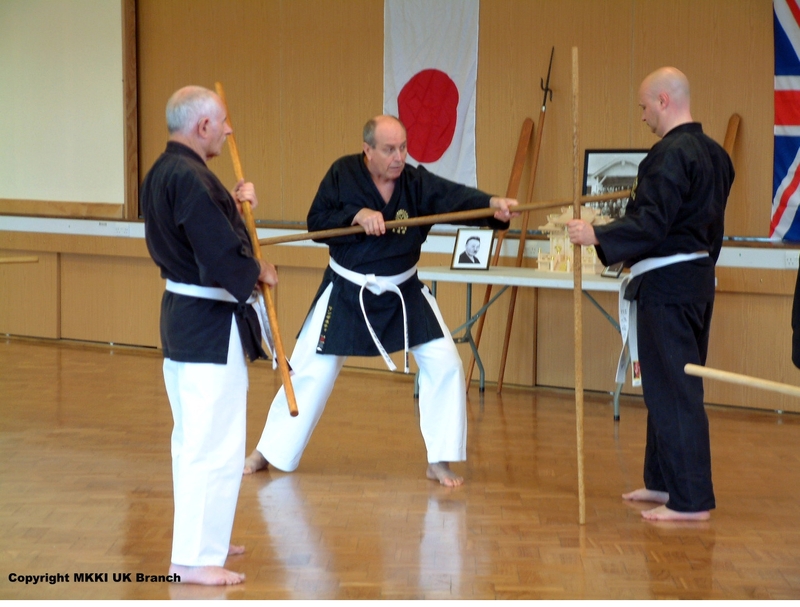 In addition how Matayoshi Kobudo has evolved into one of the largest systems in the world and how the official Ryu, as represented by the Kodokan in Japan, has developed. 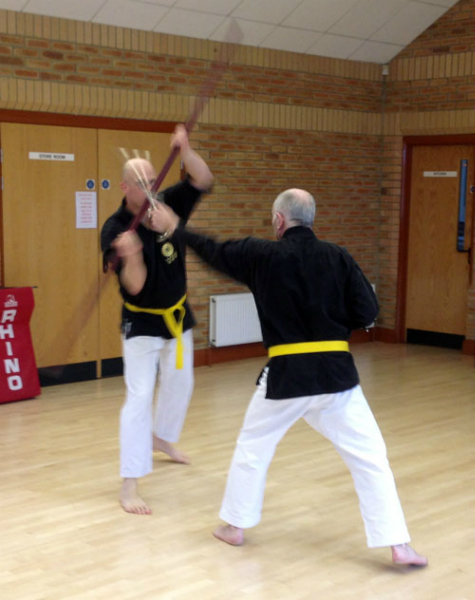 Kobudo is the study of Okinawan weapons which has been said to have evolved throughout their history. 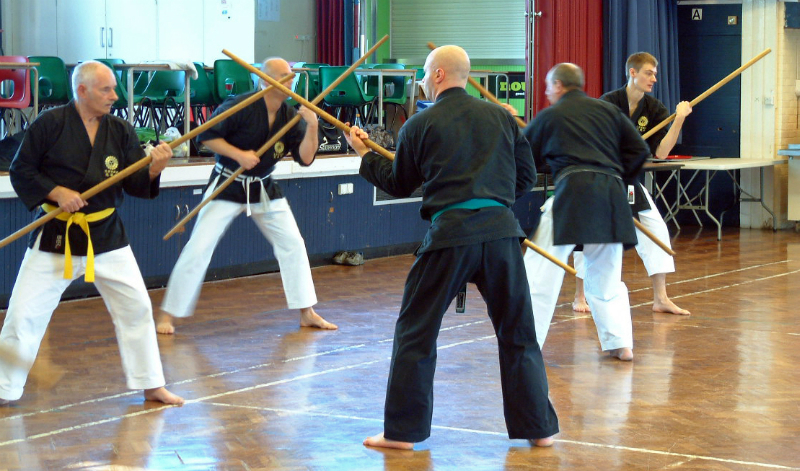 In fact the term “kobudo” itself means “ancient martial way”. 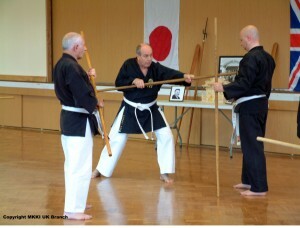 If we study the historic relationshi p between Okinawa, China and Japan we can get an idea on how kobudo has developed. 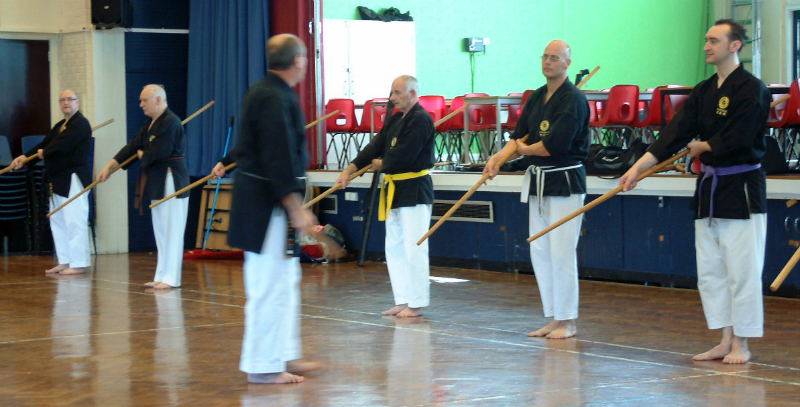 However, there is no key point in their history which suggests the origin of kobudo and therefore it is hard to pinpoint an exact date. 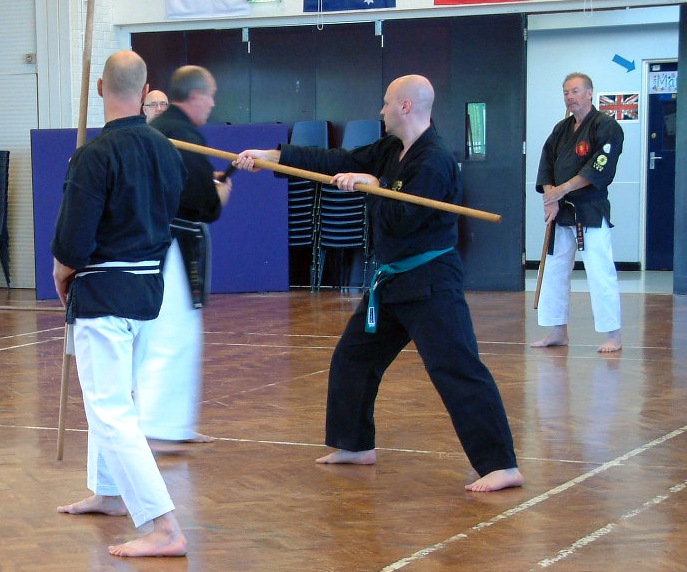 What we do see is that there are certain times in the Okinawan history whereby kobudo may have originated from. These historic times are now discussed below. Prior to 1429 Okinawa was divided into three kingdoms, Nanzan, Chuzan and Hokuzan, each ruled by anji who constantly fought for control and therefore Okinawa was used to constant war. So they were familiar with the carrying and the use of weapons. This all changed in 1429 when the Chuzan King, Sho Hashi conquered the Hokuzan kingdom and eventually uniting the three kingdoms together. This started the period in Okinawans history called the “Golden Age of Trade”. The Okinawans enjoyed peace as the First Sho Dynasty began. Okinawa’s geographical position, in that it was at the crossroads to the trade route to China, Japan and the other Asian countries, enabled it to flourish and its relationship with China grew. There was a boom in cultural exchange between these two nations. It was during the second Sho Dynasty, in 1469, when King Sho En outlawed his subjects to carry and possess weapons. This was to appease China, but also to protect himself from his enemies. The trouble was that China began to see Okinawa as a possible tribute state, but so did Japan. So the peaceful time ended when Japans feudal leader, Toyotomi Hideoshi ordered the Ryu Kyu Kingdom to support him in the invasion of Korea. This was declined by Okinawa as Korea was a tribute state of China and they did not want to lose their relationship with the Chinese. This decision by Okinawa eventually led Japan to arrange for the Shimazu clan of Satsuma to invade Okinawa. This invasion took place in 1609 whereby two and a half thousand samurai set sail for Okinawa. Shimazu clan were a very strong warrior clan, have gained vast experience in the Japanese wars. The invasion was swift as the Okinawans did not put up much of a fight due to the Shimazu being well trained in combat and the Okinawa King, Sho Nei telling his people that “life itself is a treasure” and to spare themselves any bloodshed. It was from this period that Okinawa became a vassal state under Satsuma, with Japan having a controlling influence. Shimazu wanted to keep the appearance of Okinawa as a tribute state to China, under their controlling authority in order to keep the trade relations going for their selves and Japan. During the occupation the Shimazu clan prohibited the Okinawan Pechin class from wearing and the use of weapons. 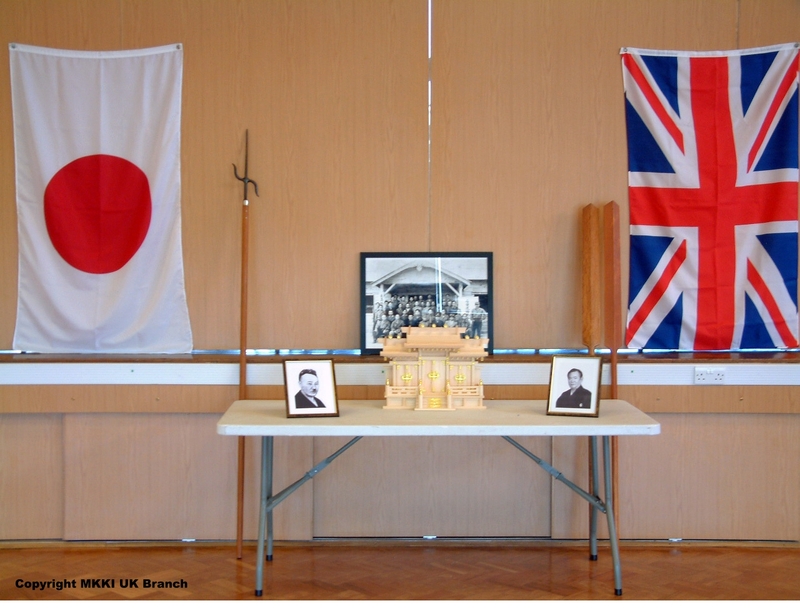 It is a belief in this part of Okinawa’s history that the farming tools of Kobudo evolved as weapons. However, there is no real evidence of this and in fact modern day historians have uncovered evidence to the contrary which suggests it was the Pechin class, and not the farmers of the Heimin class that practiced the study of Kobudo. Although Japan closed trade relationships to most of the outside world, Okinawans still had good relationship with China and the other Asian countries for trade. The Pechin class were able to travel to these countries, and emissaries could travel to Okinawa exchanging goods and culture. 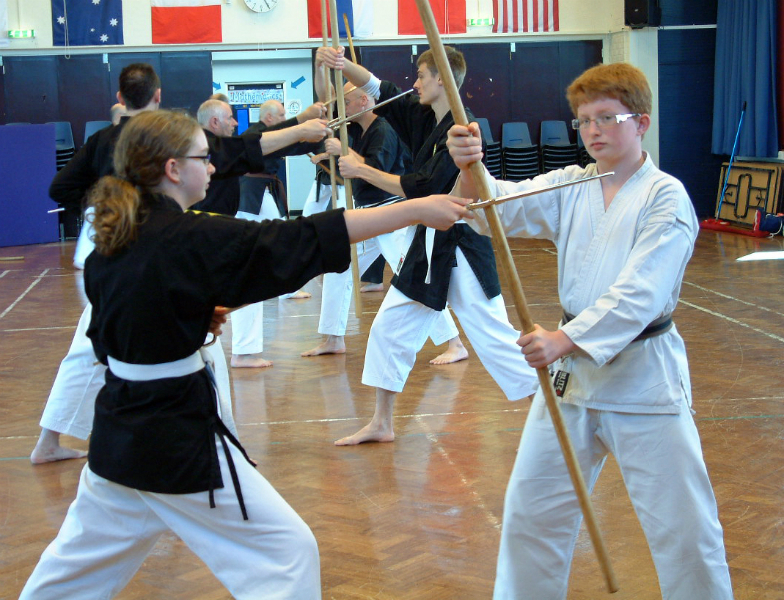 Thereby the Pechin class could study and impart methods of the martial arts, such as karate and kobudo. In fact in their history of the martial arts there is strong evidence of Chinese influence. Most of this training was carried out in secrecy and the systems of the various styles were therefore handed down verbally from master to student. Some of the early practitioners of Kobudo were eminent masters such as Sakagawa Kinga (1733 – 1815) and Chatan Yara (1740 – 1812). In fact it is believed that Sakagawa learnt a lot of his art from China. Sadly during the Second World War’s Battle of Okinawa the island was devastated. As a consequence a lot of knowledge was destroyed. However, those systems that did survive are still practiced today. Their teachings came from prominent masters, such as Matayoshi Shinko and his son Shinpo, Shinken Taira, Inoue Motokatsu to name but a few. 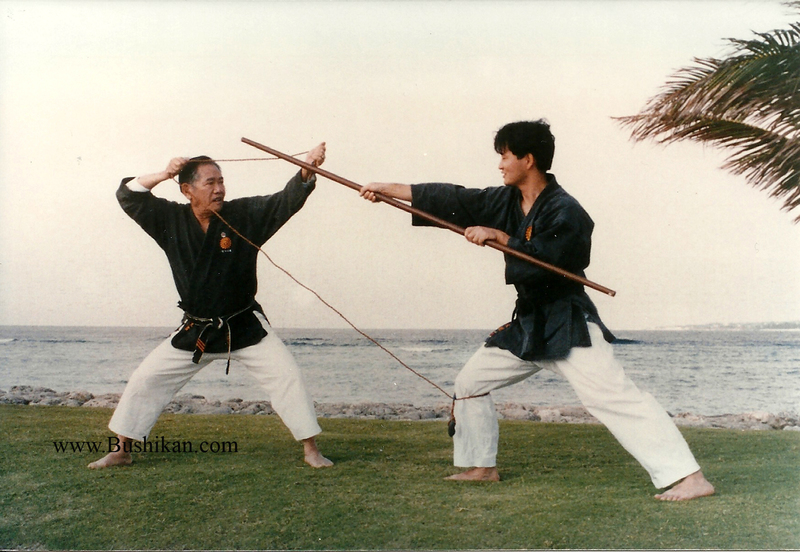 One of the worlds wide known masters in kobudo today is Matayoshi Shinko. The unique style of this family kobudo is due to the strong Chinese influence, and the reason for this influence was down to Matayoshi Shinko Sensei studying the art for over 13 years in China. Matayoshi Shinko was born in Naha, Okinawa in 1888 to a wealthy business class family. He was the third son of Matayoshi Shinchin, and was the only member of his family to be involved in the martial arts. As a teenager Matayoshi Shinko started his training in kobudo under the tutelage of Agena Chokuho Sensei of Gushikawa village. During the period he was exposed to the weapons of Bo, Sai, Ueku, and Kama. Later he became a student of Irei Sensei from Nazato, Chatan Town, where he was taught the art of Tunkua and Nunchaku. In 1911 at the age of 22, Matayoshi Shinko left Okinawa for adventure in Manchuria. During his time there he joined a nomadic mountain tribe. They taught him how to use the bow and arrow from horseback, called Ba Jutsu, the art of throwing blades, called Shuriken Jutsu, and the art of the lasso, called Nagenawa Jutsu. He spent some time in China and travelling to various parts of Asia studying the martial arts up until 1915. He returned to Japan and during this year he gave a demonstration in Tunkua and Kama at the Imperial Memorial Budo Festival, Meiji Shrine in Tokyo. This was at the same time that Funakoshi Gichin demonstrated his art of Shotokan Karate. 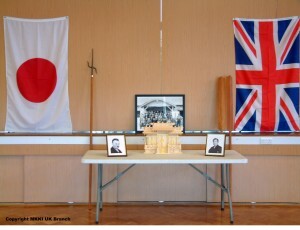 As with karate it was the first time Okinawan Kobudo was publically seen in mainland Japan. Then in March 1921 when the Crown Prince (later Emperor) Hirohito was visiting Okinawa, Matayoshi Shinko gave a demonstration in kobudo, alongside Miyagi Chojun who demonstrated his karate. This was the same year that his son Matayoshi Shinpo was born. The Crown Prince was so impressed with Matayoshi’s kobudo that he awarded him with the Royal Emblem, the Kiku flower emblem to be worn on his gi. This emblem is still worn by the current day practitioners of the Matayoshi Kobudo Kodokan, as allowed by the present day family. It was when his son Matayoshi Shinpo was around six years old, in 1927, that he introduced him to his kobudo. Soon after Matayoshi Shinko returned to China, this time visiting Fuchow and Shanghi. While in Fuchow he learnt the art of Chinese boxing, Shoriji Kempo. Then in Shanghi he studied the arts of Nunti, Timbe and Surichin. He also studied herbal medicine and acupuncture under a master called Kinkoroushi. He eventually returns to Okinawa in 1935 to settle back down in Naha. 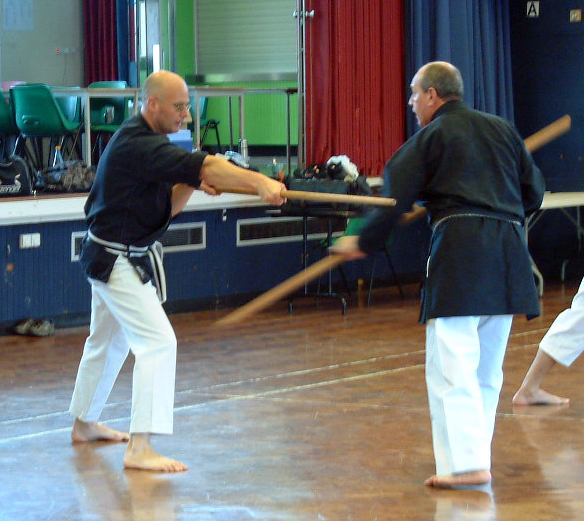 During this period of his life Matayoshi Shinko incorporates many of the weapons that he has learnt to form the foundation of the Matayoshi Kobudo system. Two years after in 1937 he teaches his son, Matayoshi Shinpo the art of Kingai Ryu Karate. Matayoshi Shinko was a well respected martial artist in Okinawa and was know as “Kama nu Matehi”, meaning Matayoshi the Kama. Sadly he passed away at an early age of 59 in 1947. 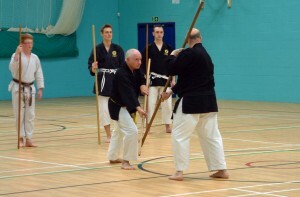 However he has left a legacy in which his son took over in this art of Kobudo Jutsu. Matayoshi Shinpo was born in Yomitan village located in Nakagami district, Okinawa on 27th December 1921. This was the same year his father gave the demonstration to Prince Hirohito, who stopped over in Okinawa on a visit to Europe. But it wasn’t until the age of 6 that his father introduced Matayoshi Shinpo to martial arts, which included his father’s empty hand of Kingai Ryu. In 1937, his father took Matayoshi Shinpo to a Chinese tea importer by the name of Gokeuki Sensei (Wu Xian Gui in Chinese) to learn the art of Hakaku Kempo. Although he had many instructors throughout his life his father was his lifelong instructor and mentor. It was in 1938 when Matayoshi Shinpo Sensei decided to move from Okinawa to Kawasaki-shi in Kanagawa-ken, mainland Japan. Here he stayed for 19 years in the city of Kawasaki teaching and training in martial arts. After 19 year he decided to return to Okinawa in 1957 in order to teach Kobudo in many of the Goju Ryu dojo, specifically those of Higa Sensei. It was during this period that he realised karate was becoming more popular and growing fast and leaving the art of kobudo behind. So Matayoshi Shinpo Sensei set about to readjust this and to make kobudo as popular amongst the Okinawans. He decided to form his own dojo, which he did in 1960 in Naha. He called his dojo “Kodokan” which means “Hall of the Enlightened Way”. The name was a dedication and memory to his father Sensei Shinko Matayoshi. The kanji “Ko” in Kodokan has a meaning of “light” and is a tribute to “Ko” found in his father’s name Shinko. The weapons studied were Bo (of several lengths), Sai, Nunchaku, Kue, Suruchin, Timbe and Nunti etc. He then set about uniting Kobudo practitioners all over Japan. His aim was to spread the art of kobudo and to maintain the traditions of the system as passed down from masters from the early days of the art. This was so successful it led him to form the Ryukyu Kobudo Association in 1960, which later in 1972 became the foundation of Zen Okinawa Kobudo Renmei. This organisation still exists to this present day. Five years after the opening of the Kodokan, in 1965 Matayoshi Yasushi was born who is today’s Soke. 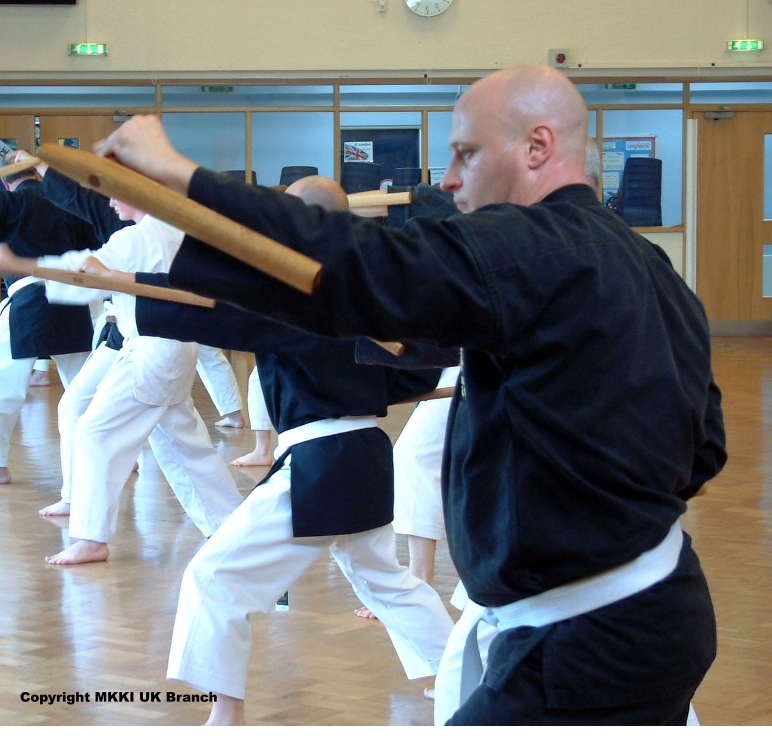 In the same year Itokazu Seisho Sensei began his training with Matayoshi Shinpo Sensei in kobudo. In 1981 Matayoshi Shinpo Sensei first met Sanguinetti Franco Sensei during the first International Okinawan Goju Ryu Karate Federation’s International Gasshuku and Tournament in Okinawa. Sanguinetti Sensei then began his training with Sensei Matayoshi in 1982. It was in September 1997 that Matayoshi Shinpo Sensei passed away at the age of 76. Like his father before him he had left a legacy in martial arts, and came be seen in numerous videos on the world wide web performing his karate and kobudo. He has now left the mantle to his son Matayoshi Yasushi Soke and to his chief instructor Itokazu Seisho Sensei to carry the Matayoshi Kobudo Kodokan forwards into the future. In addition Sanguinetti Franco Sensei made a promise to Matayoshi Shinpo Sensei to help preserve and spread his father’s kobudo art around the world. The famous dojo in Naha Okinawa, the Kodokan, is still the Matayoshi family home today, whereby the family lives above the dojo. Matayoshi Shinpo Sensei second son, Matayoshi Yasushi was born in 1965 and inherited the leadership of the Kodokan Dojo when his father passed. He now continues the work that his father and grandfather had started as Stoke of the Dojo as requested by his father, Matayoshi Shinpo Sensei. 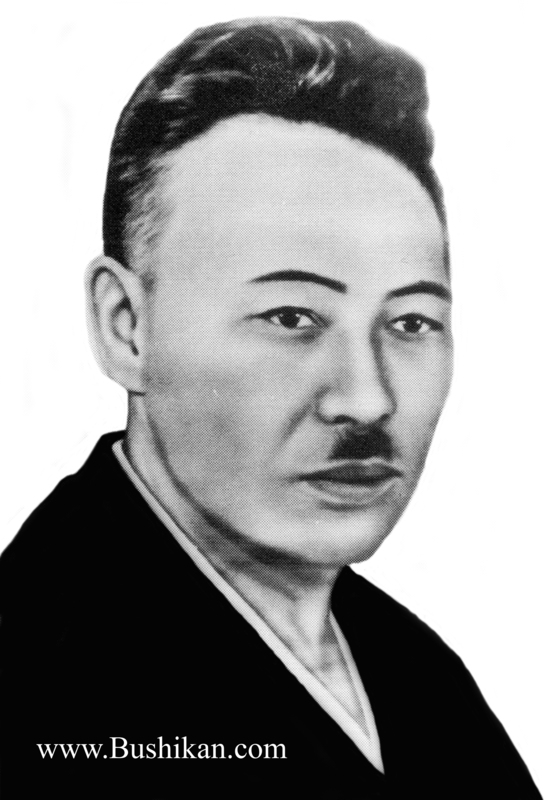 Matayoshi Yasushi’s function as head of the Kodokan is extremely important. He provides guidance and spiritual support for the Dojo. This enables it to operate under the same guidelines that his father established. 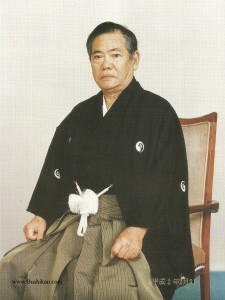 His work is to provide direct support to Itokazu Sensei who was appointed the technical director of the Kodokan in Naha. Matayoshi Yasushi's involvement with the martial arts is always been renowned. In fact he has been a member of the Board of Directors of the Okinawa-Ken Karate-Do Renmei and President of the Okinawa Prefecture branch of the Dai Nippon Butoku Kai since 1997. 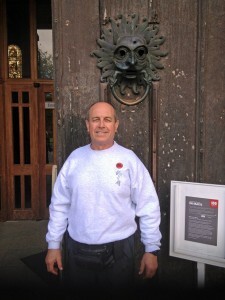 Sanguinetti Franco is the most senior western Matayoshi Kobudo Kodokan instructors outside Japan. He was born in Peru on the 26th January 1956 and began his martial arts training at the age of 16 in 1972. Throughout his budo career he has trained with strict traditional Okinawan and Japanese instructors, such as Juichi Kokubo one of Morio Higaonna direct students; and then with Higaonna himself. Sanguinetti Sensei first met Matayoshi Shinpo Sensei at the International Tournament and Gasshuku for Goju Ryu in Okinawa in 1981. Then during his stay in Okinawa from 1982 to 1983, he trained in three different dojos, and became a direct student of Matayoshi Shinpo in 1982. He has a vast background in the martial arts and a very prominent instructor in both Okinawan Goju Ryu Karate and Matayoshi Kobudo. He is still a member and student of Shihan John Roseberry in the Shorei Shobu Kan. He has competed over 13 years which has earned him the position to compete with the Peruvian National Karate Team and the Venezuelan National Karate Team. 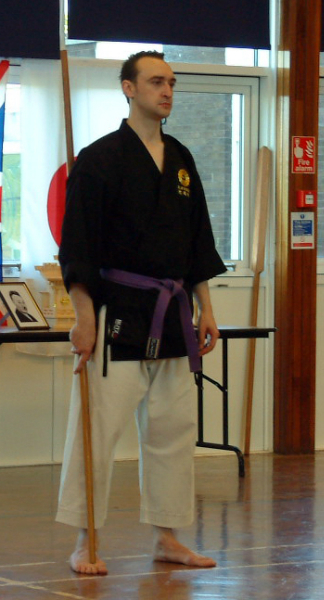 He is currently a Nana Dan in both in Karate and Kobudo. 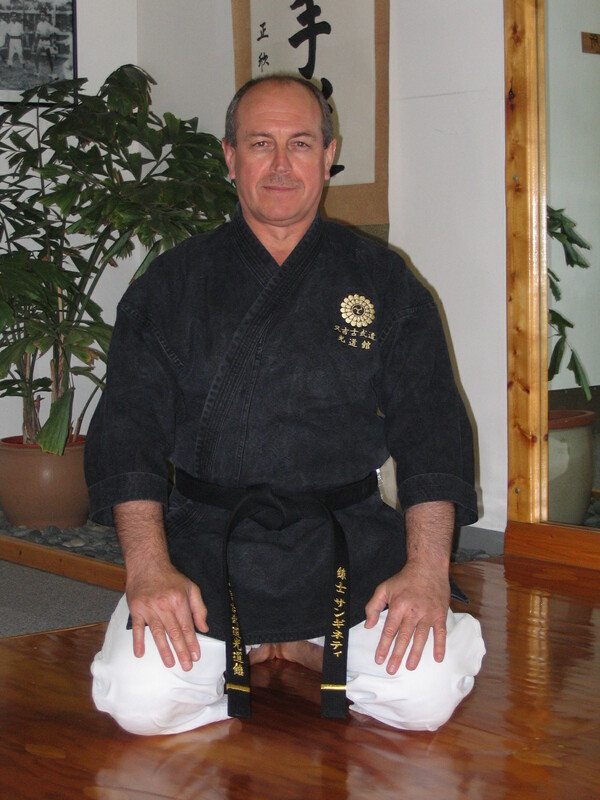 Sanguinetti Franco was awarded his Menkyo (teaching licence) by Matayoshi Shinpo in 1997. He also made a direct promise to Matayoshi Sensei before he passed away to help spread this fine art through out the world. 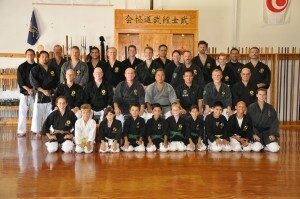 This he is now undertaking, which started by moving to the USA in 1985, where he has a dojo in San Diego, California. 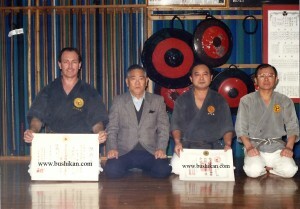 From here he formed the Matayoshi Kobudo Kodokan International organization in 1996. It is the honbu dojo for all the other member countries in Australia, Europe, Bermuda, America – north and South, and India. Sanguinetti Sensei travels to all these dojo’s fulfilling his promise he made to his instructor Matayoshi Sensei. In addition he has continued to travel and take groups, every year from the MKKI to the parent dojo in Japan, the Kodoakan to train under Itokazu Sensei. The MKKI was formed by Sanguinetti Franco in 1996 for the sole purpose to preserve and spread the art of Matayoshi Kobudo as promised by him to his mentor Matayoshi Shinpo. 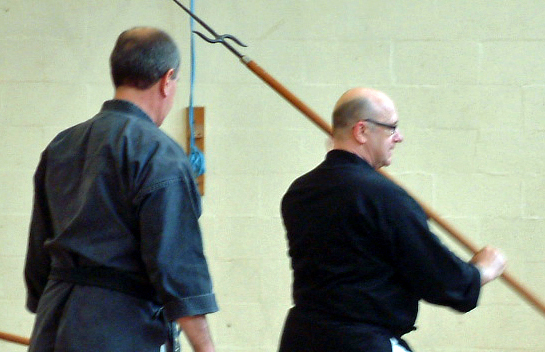 The teaching by Sanguinetti through the MKKI promotes and motivates the members in the system of Matayoshi Kobudo. 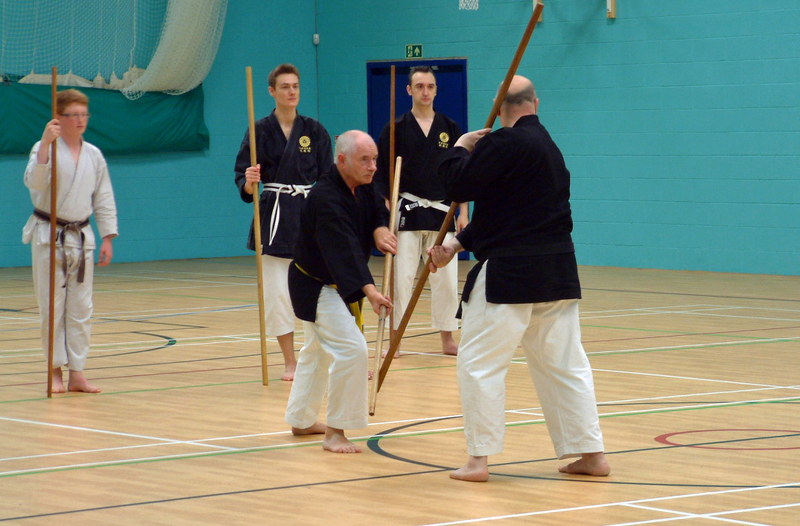 It also provides other Budo-ka’s the opportunity to train in the official Matayoshi Kobudo as it is directly linked to the family’s dojo in Naha Okinawa – the Kodokan. 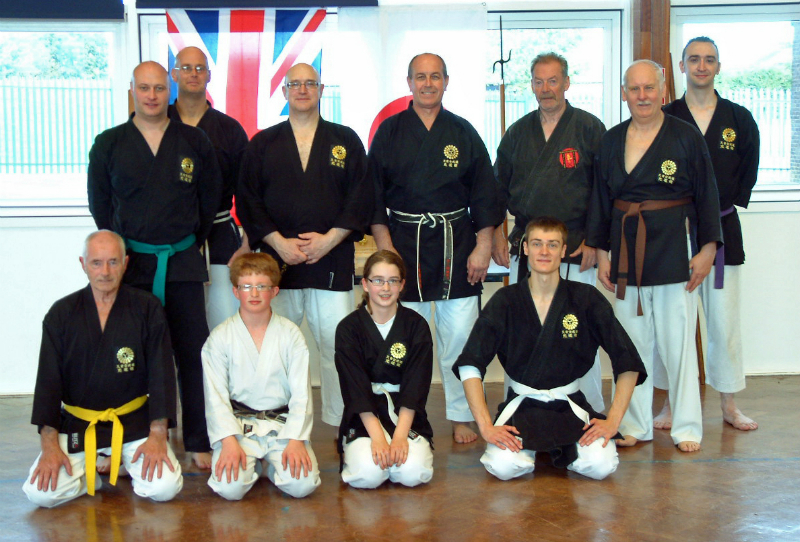 Since its emergency onto the world scene many dojo’s throughout the world have associated themselves to the MKKI, and the UK Branch was formed back in 2007. 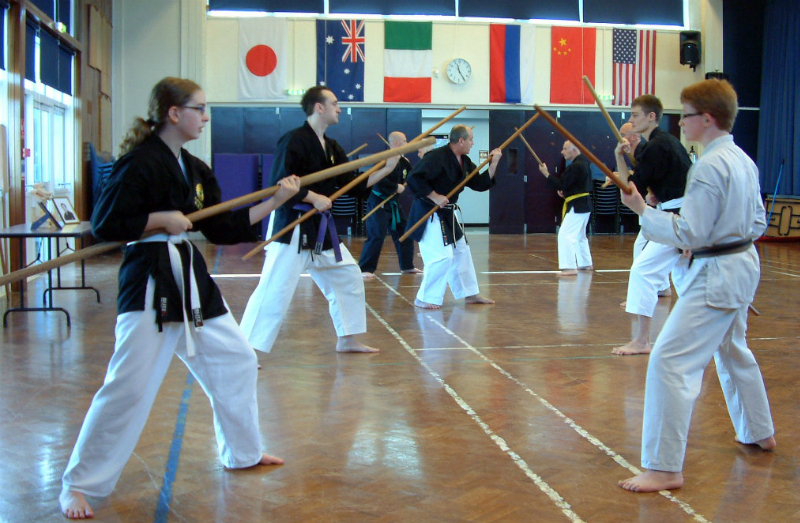 Matayoshi Kobudo is one of the largest systems of kobudo in the world today. There are many organizations that claim to be teaching Matayoshi Kobudo, however, the legendary Kodokan in Okinawa, the Matayoshi family’s dojo, is the only organization in the world that represents the true sole of Matayoshi Sensei; it is still being run by the Matayoshi family. 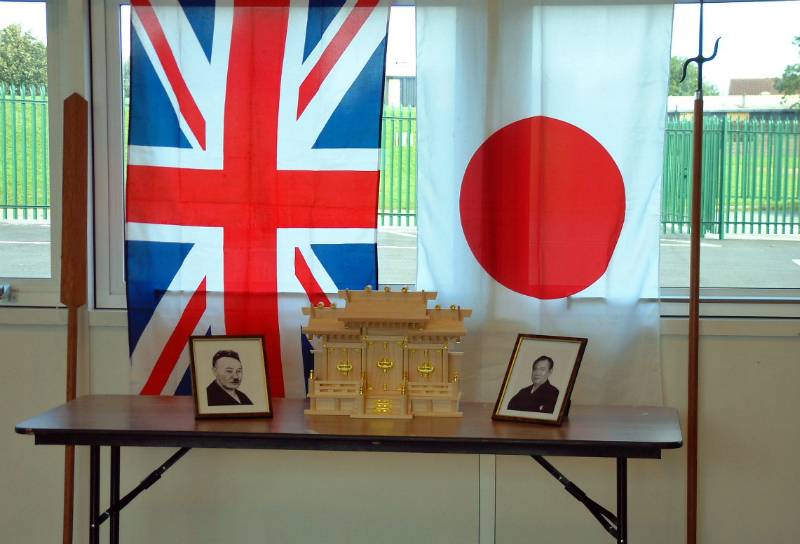 The MKKI-UK branch has slowly grown since 2007, with its honbu dojo in Darlington, County Durham. They also have prospective branches in Scotland and Nottingham. 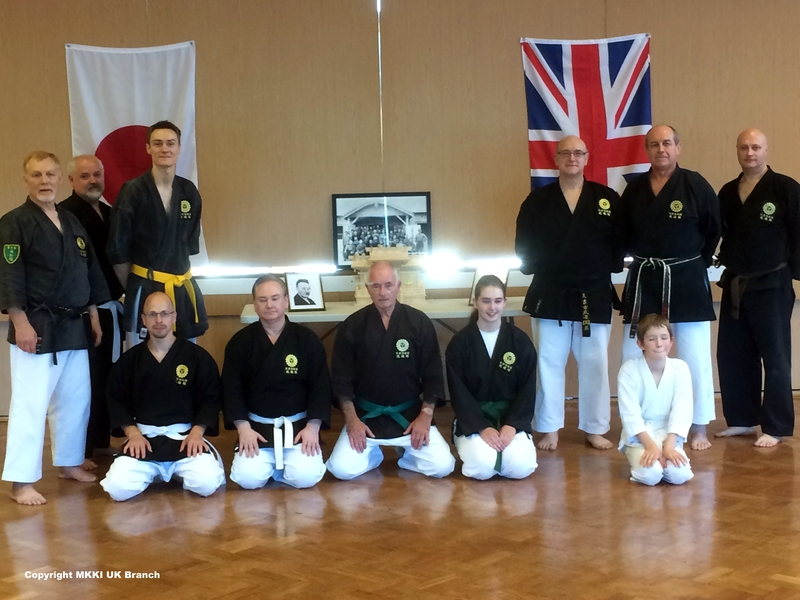 They have held Gasshuku training camps every year since 2007 whereby Sanguinetti Sensei comes to England to teach and grade the MKKI-UK members; some have seen instructors from European MKKI Branches. 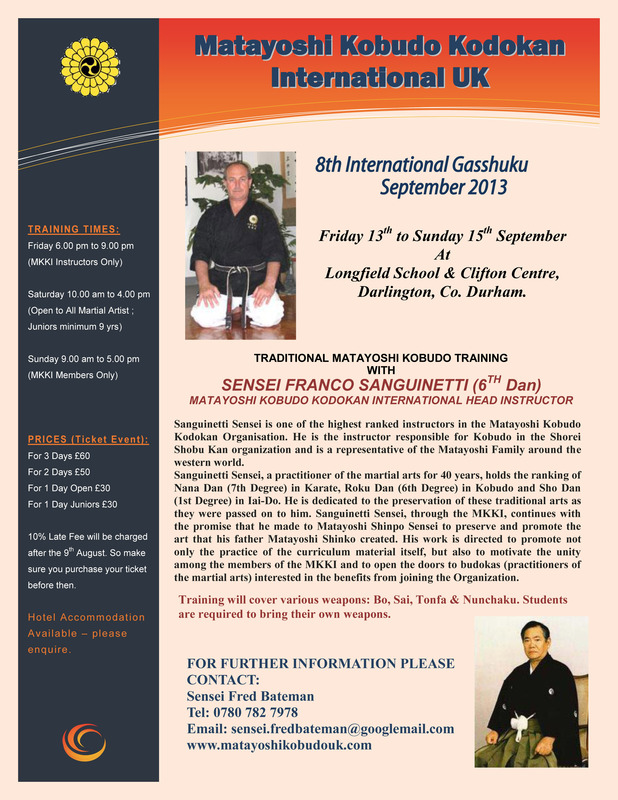 The last Gasshuku was in September 2013 and the 8th Annual Gasshuku next will be in September 2014 in Darlington. In addition to these the UK’s instructor Bateman Sensei holds regular Seminars for the members on a basis of six times per year. 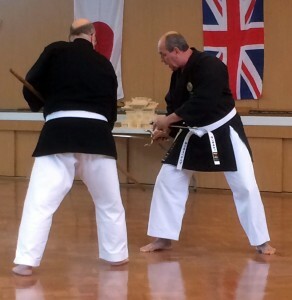 2014 saw the 9th Annual Matayoshi Kobudo Kodokan International Gasshuku. Again this was held in Darlington on the 5th to 7th September. 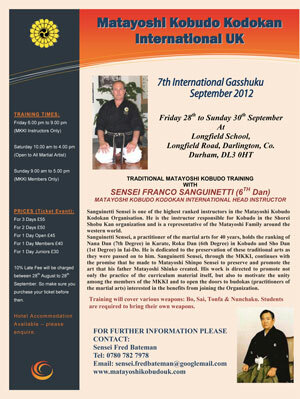 Sanguinetti Sensei arrived at Newcastle International Airport on the morning of the 4th September. 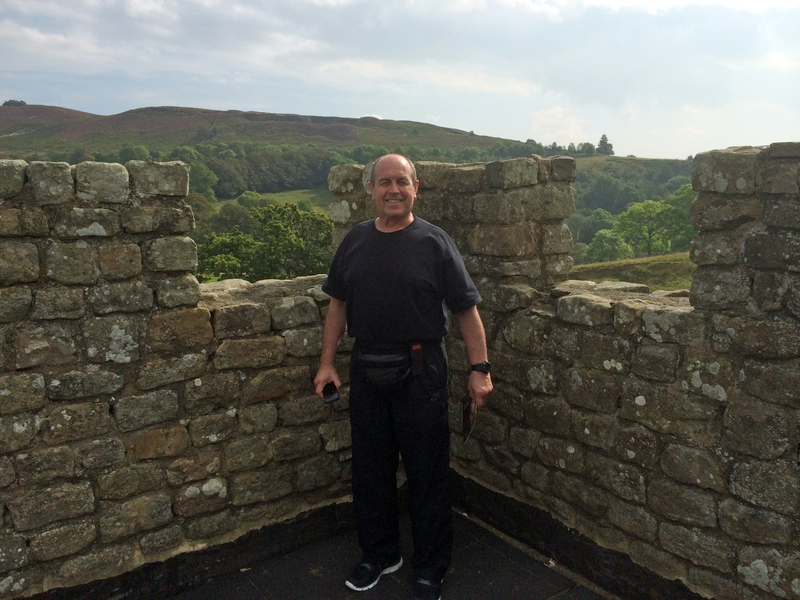 As Sensei likes history we took him to Vindolanda and the Roman Army Museum near Hadrian’s Wall. It was a long day for him so we checked him into his hotel, the Grange Darlington at 4 pm, so he could be refreshed for the start of the Gasshuku on the Friday. On Friday morning Bateman Sensei had 3 hours private tuition, working on the following kata for Nunchaku, Nunti and Kuwa. The Friday evening of the Gasshuku was for the instructors of the MKKI. This year we had two ladies from the MKKI Venezuela Group to join us here. They were Sensei Yuraima Borrero and Gisela Duran. During the evening after warming up we covered Bo and the associated Bunkai. 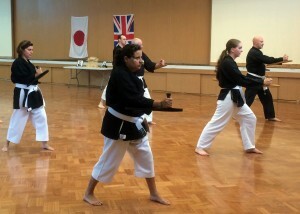 We then moved on to drilling Sancho Sai Kata. The evening was finished off socializing and eating pizza. On arriving at Longfield School gym at 9.30 am Saturday morning everyone was keen to start. The day was going to be long training from 10 am to 4 pm, but we all knew we were in for a great day’s training. We were told by Sensei to wear white belts, which we did including Sanguinetti Sensei. He grouped us together and explained the reason for this. His explanation was first in Japanese as he showed us the Kanji, which was embroidered on his white belt. He said he would provide me with this kanji and the explanation so we can get them embroidered on our white belts for future Gasshuku’s. The explanation is to remind us on where we have come from, and so that no one focuses on their coloured belts. For example a high grade may think they know the techniques that they have done for many years, and therefore miss the important aspects when it is taught again; having a closed mind to what is being taught; in other words having “a beginners mind”. We started with the warm ups that is always done with the Bo. 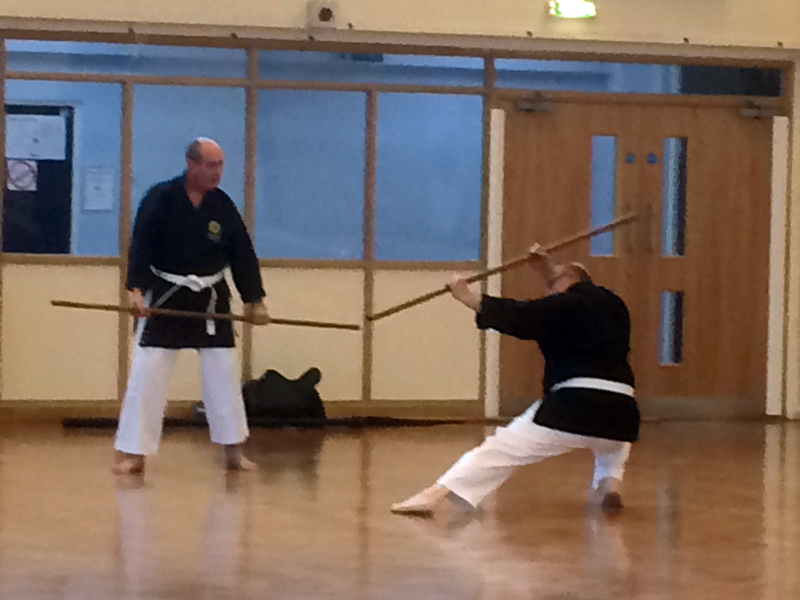 This was followed by the Bo No Hojo Undo and associated bunkai. 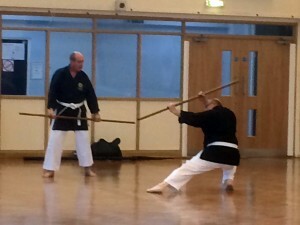 After kiuke (a break) we moved onto Sai No Hojo Undo; perfecting and becoming confident in each technique and the weapon. This year Sanguinetti Sensei expanded on the bunkai, which was more advanced than previous years. The reason for this was the fact that we had become more capable of handling the sai. 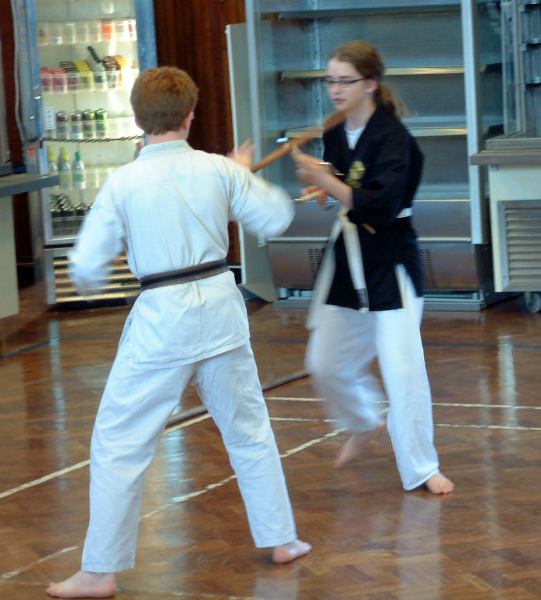 It involved linking up the bunkai giving much more attacking and associated counters. Just when you thought you had the bunkai nailed, it then expands and takes on a new meaning. Sensei was happy to see that we no longer was looking to hit the opponent’s weapon, but looking to strike the opponent with depth and determination. Whoever was on the receiving end of this attack had to make sure that they blocked that weapon, but conversely the attacker had to have the confidence in controlling the weapon if the block was not made correctly. Lunch time came around quickly which not only gives us time to had some fluid intake and a bite to eat, but also to write up some notes on what was taught during the morning. In the afternoon we changed weapons again to Tunkua. The first part was to drill the Tunkua No Hojo Undo. 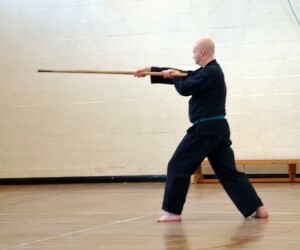 This was followed by Tunkua Dai Ichi, the first of the Tunkua Kata. While the group was working on the Kata, Sensei took me to one side and started teaching me the 3rd Dan Bo Kata, Sakugawa No Kun. As we went through this he explained the associated bunkai, which was completely different to what I expected just by seeing the kata. This explanation of the bunkai just reinforces to me that you can’t learn these kata just from DVD; you need a good instructor to pass on the knowledge. This kata is so much harder to learn than Shushi and Choun no Kun and I can now see why it is a 3rd Dan kata. By 4 pm we were full to the brim with information and tired from the day’s training. But we all had to admit that each year the length of training is getting easier to cope with. A group picture was taken in our white belts and one with the two ladies from Venezuela. Now it was to be a quick shower and back out for the Gasshuku evening meal at The Farmhouse Inn for 7.00 pm. The company and stories during the evening were good making the evening go by quickly. On the Sunday the group wore their normal belts and similar to last year’s training the day started at 9.00 am. 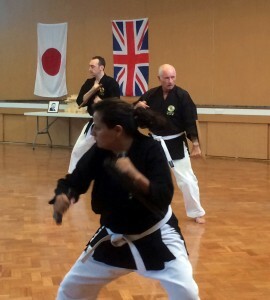 After the normal Bo warm up we started with Bo no Hojo Undo Dai Ni and then moved onto the bunkai. 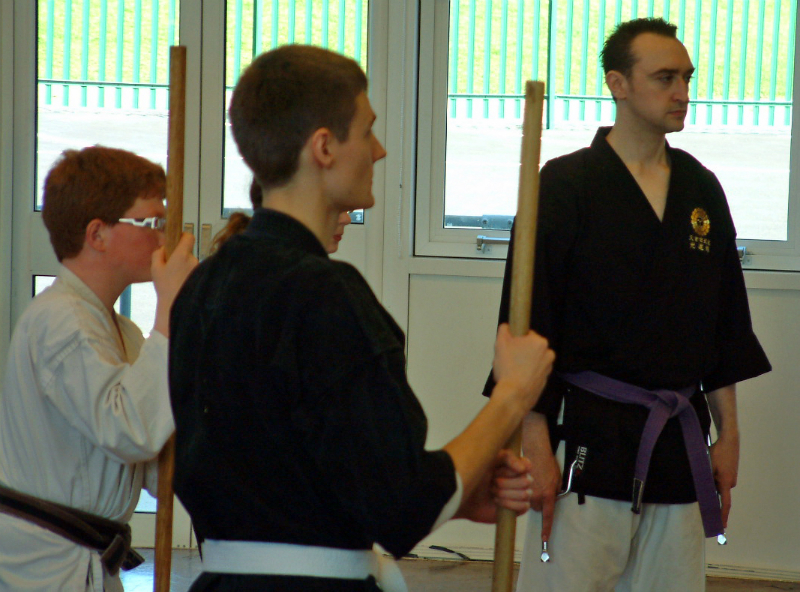 As with the Sai during Saturday’s training this bunkai had also been expanded, and more in-depth explanation was given by Sensei. We focused and worked on blocking and countering with continuous movement and getting Maai right – the concept of movement, timing, space and opportunity. After a short fluid break (Kiuke) we changed to nunchaku. This started with the usual weapons Hojo Undo. Sanguinetti Sensei explained that every movement involved either a strike or a block. So what looked initially like a catch was not! 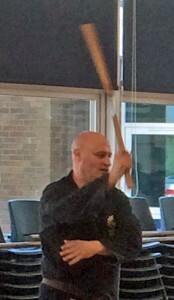 He then split the group into two the higher kyu grades concentrating on the Nunchaku kata. 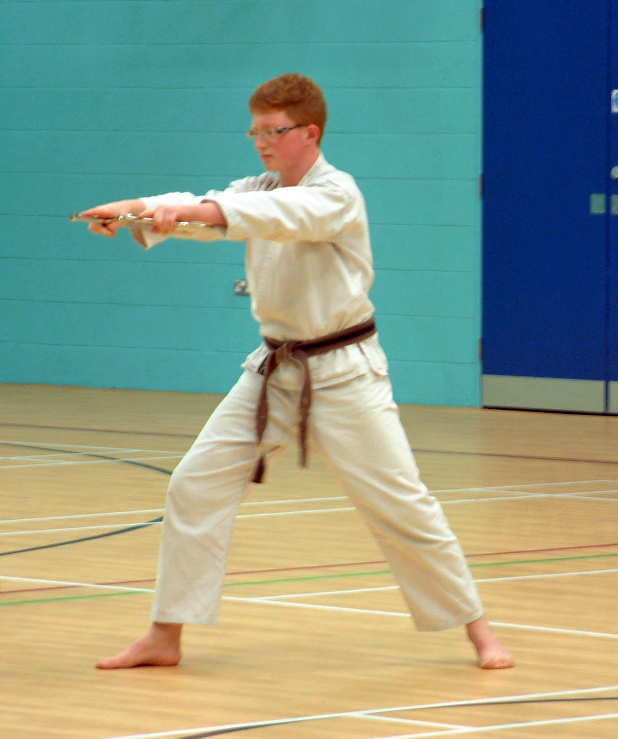 While the lower grades went on to practice their Bo Kata Shushi no Kun bunkai. Throughout the weekend Sensei reinforced the concept of Karada To Bugu Issho – Weapon and Body are One; together with Go No Sen, Sen No Sen and Sen Sen No Sen.
All had enjoyed the weekend and have got a lot from it and said it was the best yet; at least until next year! Sensei was very happy with us saying that we are all progressing in a strong positive direction. I would like to say a big thank you to Sanguinetti Sensei for keeping Matayoshi Kobudo alive around the world; he told me he goes to 14 different countries and for giving up his time come to us in the UK. 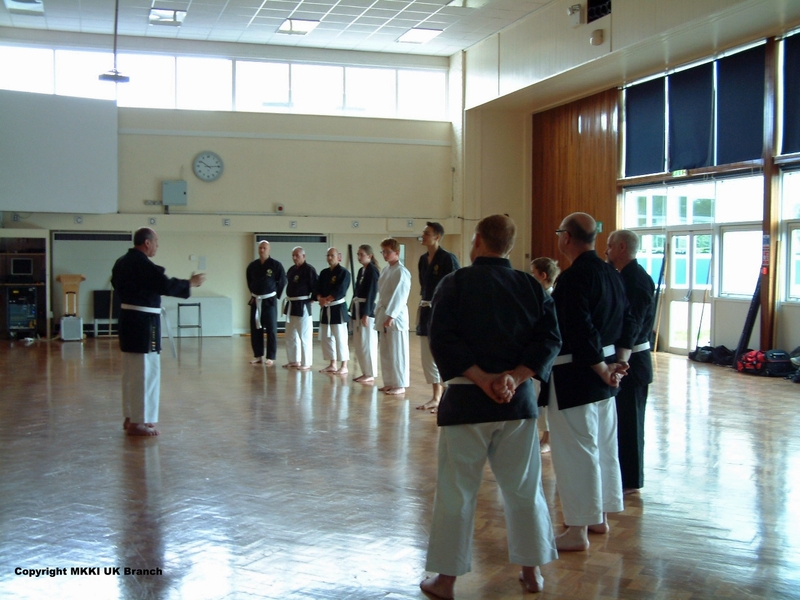 We are all looking forward to train with Sensei again for our 10th UK Gasshuku in 2014. The UK was very happy to see Sanguinetti Sensei back for our 8th Annual Matayoshi Kobudo Kodokan International UK Gasshuku on the 13th to 15th September 2013. 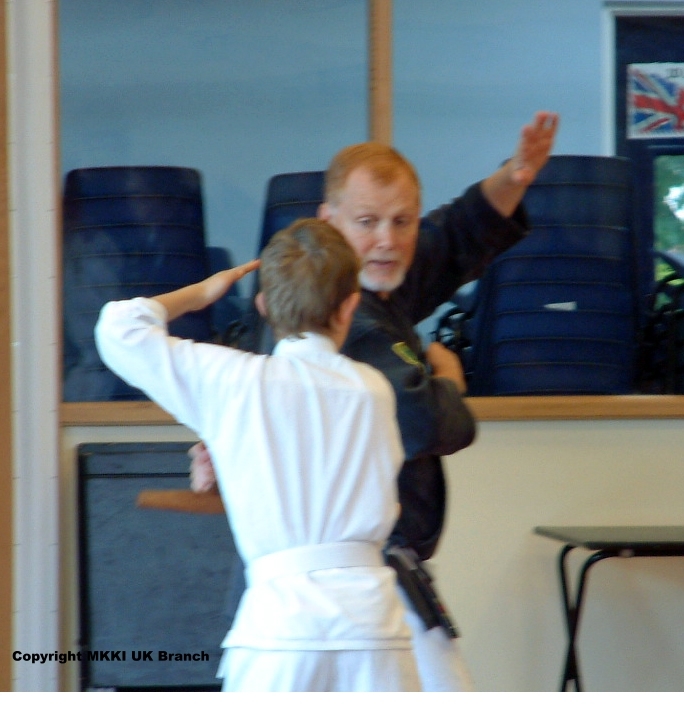 It all started with Sensei arriving in the UK on the Thursday morning of the 12th at Manchester Airport. 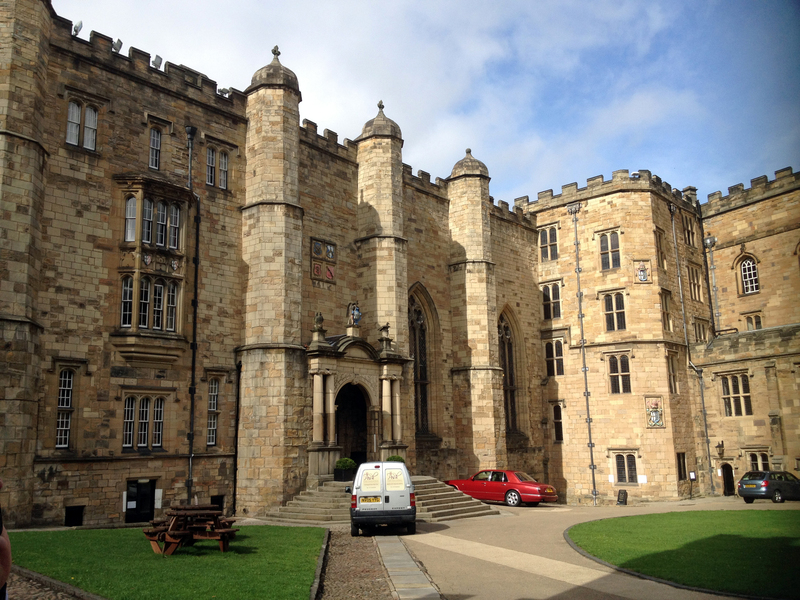 During the day we visited Durham Castle and Cathedral for a tour round before we could check in Sensei to his hotel. 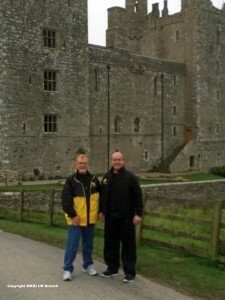 I t was a shame that we could not take sensei round the castle, but they had an event on. We did manage to get a picture from the outside though. 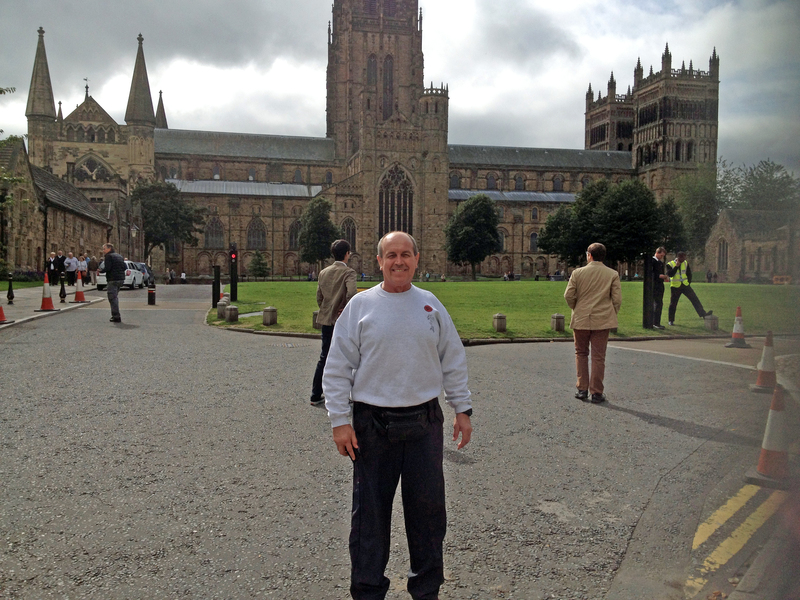 Sensei was impressed with the history of Durham, and enjoyed his time there. The training started on the Friday for the instructors and Associate Instructors. During the evening vital tuition in Bunkai for Bo and Sai was given. Explanation of Go No Sen, Sen No Sen and Sen Sen No Sen was given. Refinement on Hojo Undo Techniques as well as Shushi no Kun Kata was made. 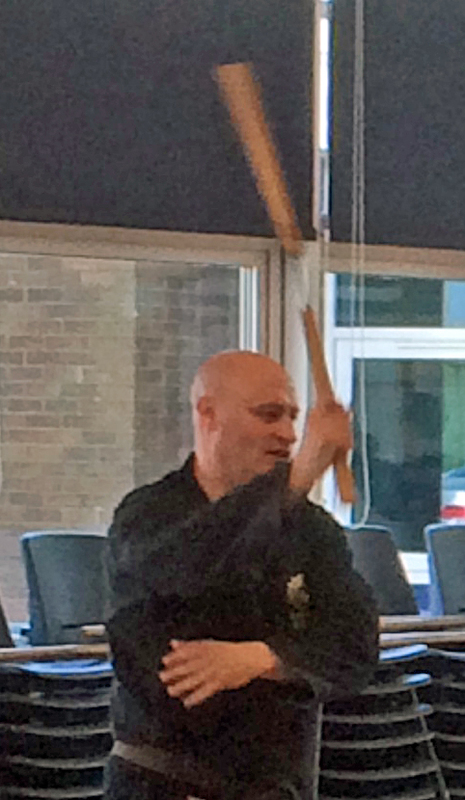 Sensei Bateman was honoured to be taught the Kue (Kuwa) Kata, which is unique to the Matayoshi Kobudo system. The evening was concluded with a pizza meal at the dojo. Saturday morning started at 10 am in the new Longfield School Gym. All the students were happy to see Sensei again. We started with partner work linking up the Hojo Undo for Bo while in Sanchin Dachi. Not only was this a good warm up exercise but it focused the mind for the day ahead. During this time Sensei made sure that we were deflecting the Bo’s energy away on the block. Making sure our techniques were correct and that the transition of the weapon during the blocks was precise. This naturally led into drilling Bo No Hojo Undo Di Ichi putting into practice the subtleties that were taught during the initial partner work. Furthermore the protocols for these Bunkai were explained. 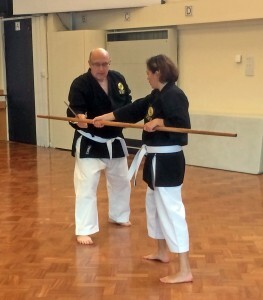 Our first Kata was in the revision of Shushi No Kun drilling in the timing of the kata. Straight after lunch the group was split into two and each went through the Kata Bunkai. Explanation of the Basic Bunkai was made by Sanguinetti Sensei, again paying attention to Bunkai order, correct technique and protocols. During the later part of the day Sanguinetti Sensei taught Nichou Sai Kata with the group, while Sensei Bateman went through the Kue Kata. 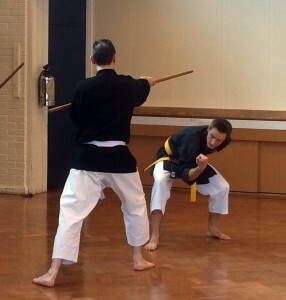 Subtle moves in this Kue kata was quite testing, but Sensei made sure that Bateman Sensei understood them. We all enjoyed our first day’s training which ended at 4 pm. So now the group was looking forward to our Gasshuku evening meal which was at the Burtree Inn. This was a great evening of socialising with Sensei, where Ken san was up to his usual self with witty conversation about his days flying airplanes. The evening ended with a few drinks with Sensei at his hotel. Sunday saw us starting our training at 9.00 pm; we were all refreshed and raring to go. Our day started with Bo no Hojo Undo Bunkai Dai Ichi and Dai Ni. 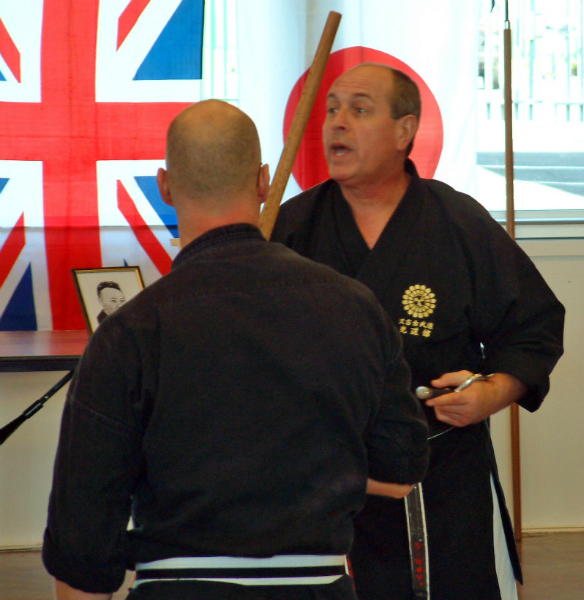 Sensei explained the importance of body movements and penetration in the striking. We went onto Sai Kata Bunkai where Sanguinetti Sensei further explained to the group the difference in Go No Sen, Sen No Sen and Sen Sen No Sen. He made references to karate during his explanation as Kobudo is just an extension of the empty hand art. After lunch as most of the group went through revision of Shushi no Kun Bunkai, three of us went through Choun No Kun and the Bunkai. First Sanguinetti Sensei made sure our technique was correct along with the timing of the kata. Then during the bunkai Sensei Bateman was going through the Kata while Ken and Marc san were his semete. This was a hard Bunkai to do because parts of the Bunkai involve semete attacking almost simultaneously. 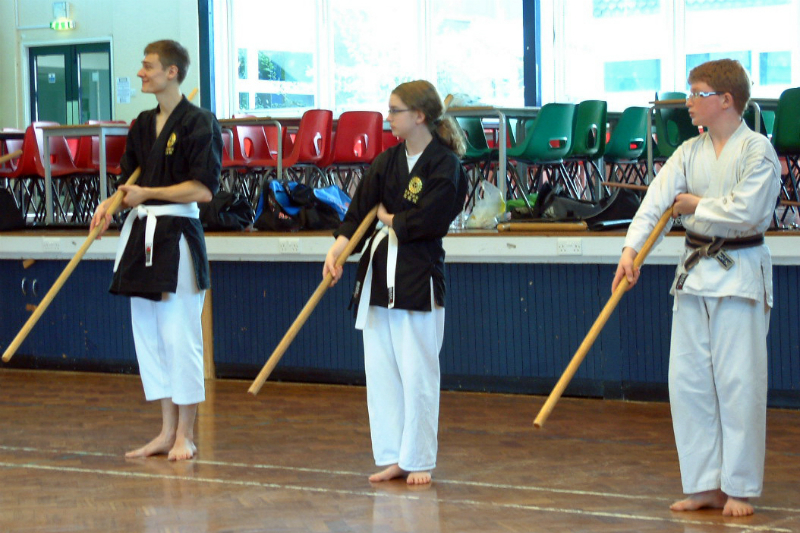 During the end of the day there was a grading for students that were recommended to take part. I would like to say a big congratulations to Marc Faux, Mike Dent, and Philip Barwick for passing there grade. It was a shame that Ken Large had to pull out during the early part of the day due to an injured foot. All have all enjoyed this weekend and have benefitted immensely with our individual improvements in this martial art. 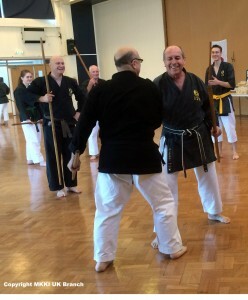 I would like to finally add a big thank you to Sanguinetti Sensei for yet again another excellent Gasshuku and for giving up his time come to us in the UK. We are all looking forward to train with Sensei again. 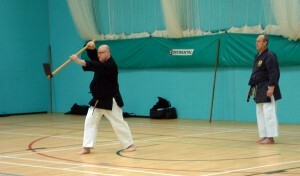 Sensei Fred Bateman gave the first Annual Seminar on the 9th Feb. He covered Bo and Sai in the main, but also touched on some Tunkua. He started with Bo no Hojo Undo Dai Ichi, then Dai Ni. The Bunkai to this was covered extensively. 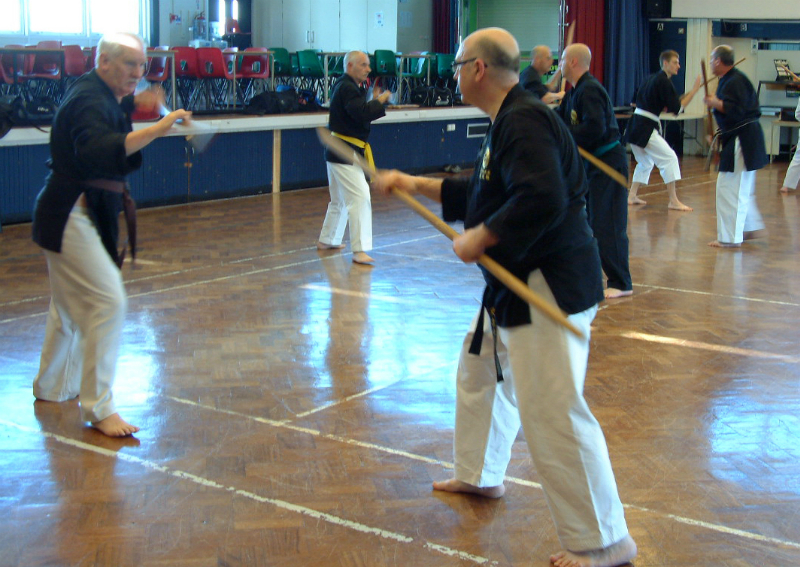 After a short water break Sai No Hojo Undo and the associated Bunkai was practised. He explained the fighting distance between Bo and Sai and the subtle movement to deflect the energy of the in coming weapon. Just before Kumite Sensei Bateman covered 4 Tunkua techniques and the Bunkai to these. 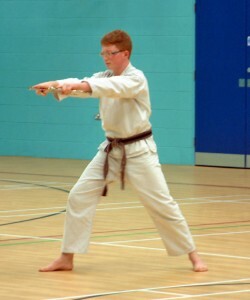 Then to finish the day the Students, including Sensei Bateman participated in Kumite. This was carried out on various weapons of the students choosing, so it could have been Bo vs Bo, or sai or Tunkua. Care had to be maintained during this period as Sensei Bateman demonstrated. All the participants enjoyed this section of the day and said that it focused the varies aspects of each weapon. 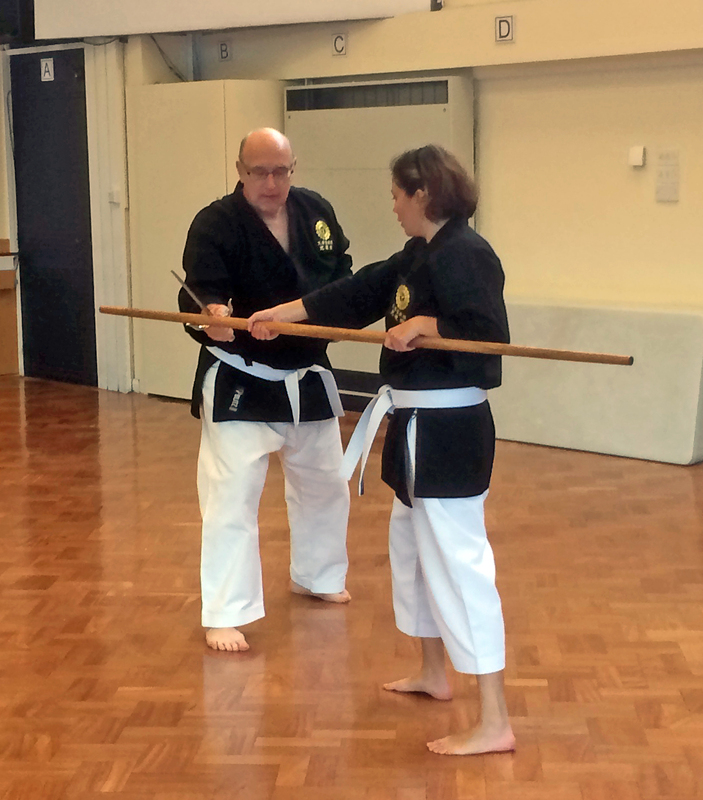 This will be our 8th Annual Gasshuku this year where Sanguinetti Sensei shall be teaching us the Official Matayoshi Kobudo Kodokan as recognised by the Matayoshi Family. 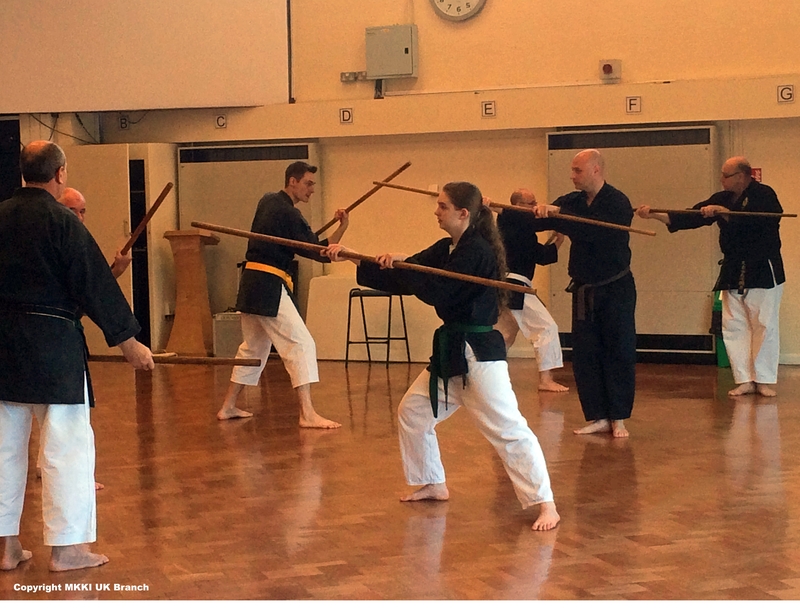 If you are interested in kobudo then don't miss this Gasshuku event. The Saturday session will be open to all Martial Artists, irrespective of style, who have an interest in Okinawan Kobudo. 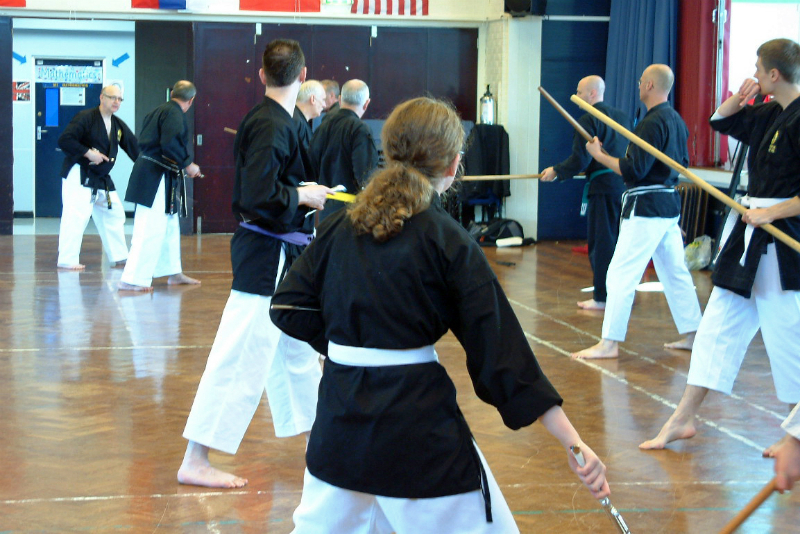 Friday will be for Matayoshi Instructors and the Sunday for Matayoshi Kobudo Members. This is a ticket event and will have a 10% Late Fee added to the above prices. This late fee will be charged for any tickets sold from 9th August to the event. so please make sure you purchase your tickets before the late fee date. Hotel Accommodation is available – please enquire. These Events have been extremely successful and enjoyed by all. So if you are interested then information can be obtained through the host contacts above. 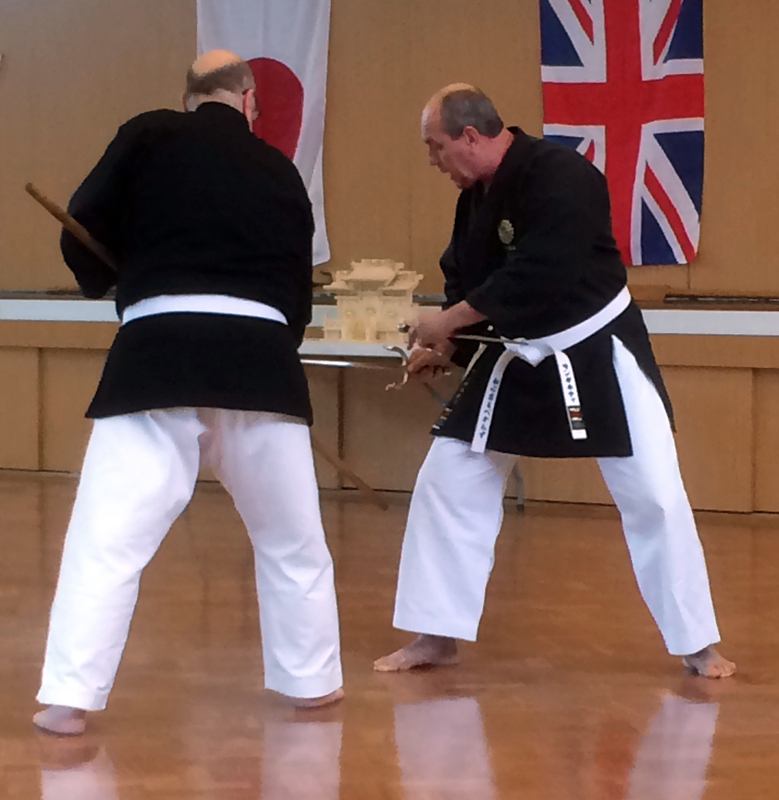 September saw the UK's 7th Annual Matayoshi Kobudo Kodokan International Gasshuku. We welcomed for the first time this year a MKKI instructor from Belgium, Ruy Sensei, and hope to train with him again soon. As always a great weekend was add by all with Sanguinetti Sensei teaching the Bo, Sai and Tunkua, and their related Kata and Bunkai. Much more principles were explained with each of the weapons, with fighting distance, penetration and dissipation of power. 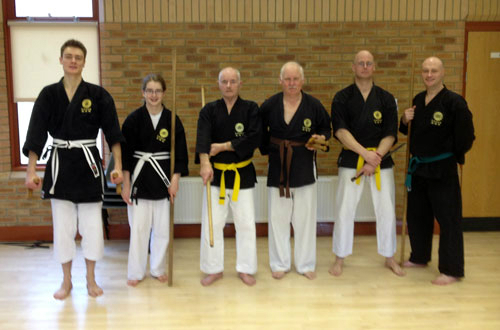 To end the weekend students were graded and all did well and passed. Below is a gallery of the Saturday and Sunday. 7th Annual Gasshuku Soon Here! It is not long now before our 7th Annual Gasshuku will be here. I hope all our students and instructors have honed their techniques ready for more excellent tuition by Sanguinetti Sensei. 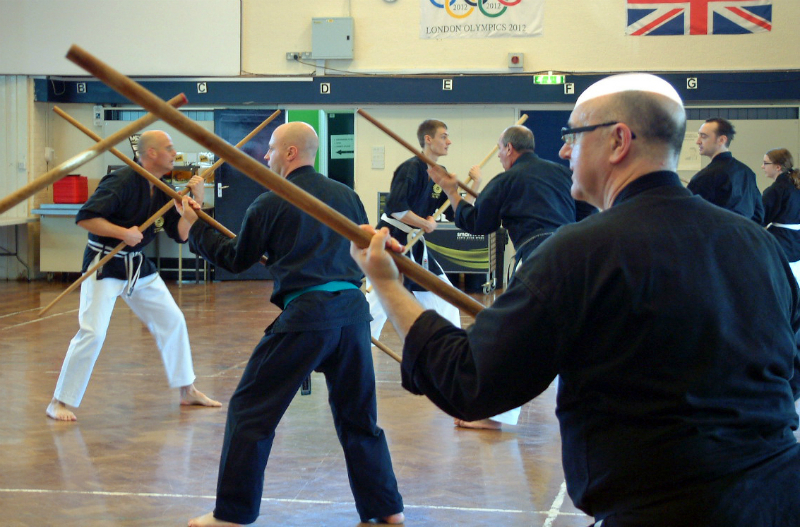 If you have an interest in traditional authentic Matayoshi Kobudo then make sure you come along to this weekend. 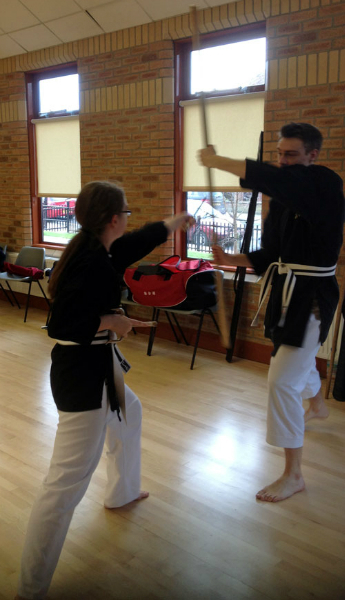 Students and Instructors for other Martial Arts are welcome to join us on the Saturday, the MKKI-UK's open day. However, time is getting short to book your place. The cost will go up by 10% as from the 28th August.